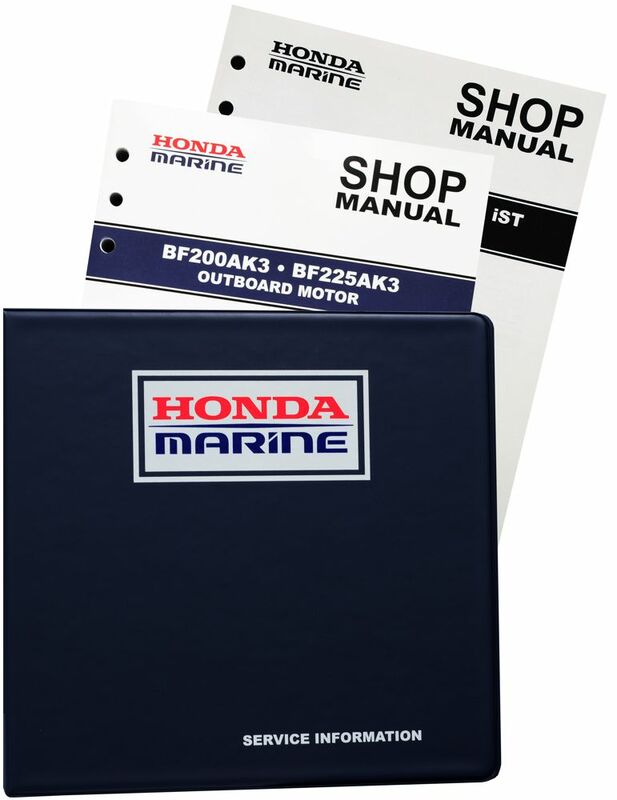 The Honda BF20, BF2A Marine Outboard Shop Manual covers service and repair procedures for the BF20 (2hp) and BF2A outboard engines. See FAQs for assistance in locating your frame serial number. 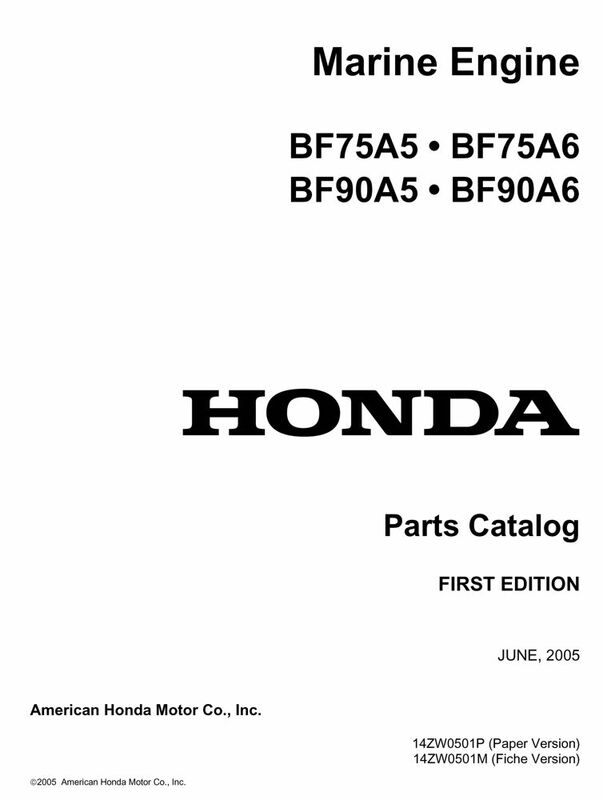 Some models have multiple manuals based on serial number. Please verify your serial number before purchasing. Enter your serial number prefix (such as BF20) in the search box to find related downloads or parts catalogs. 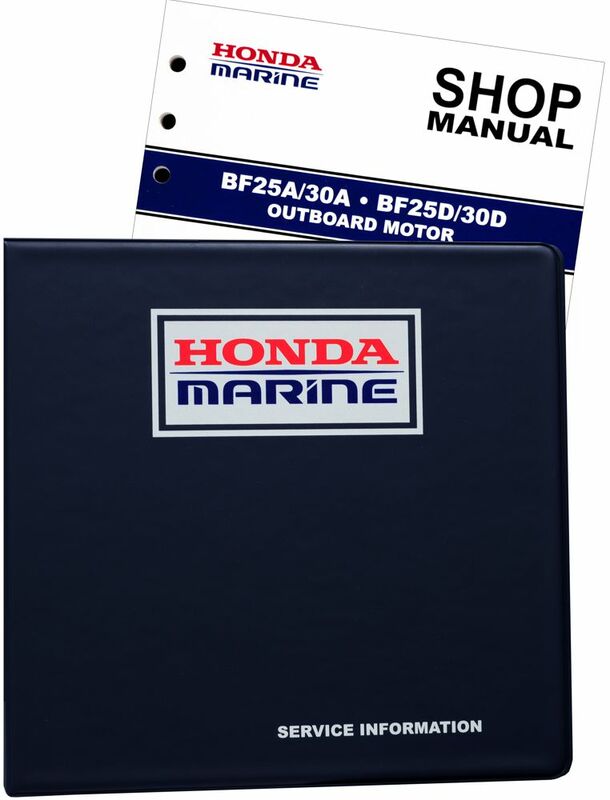 The Honda BF2D, BF2.3D Marine Outboard Shop Manual covers service and repair procedures for the BF2D and BF2.3D outboard engines. See FAQs for assistance in locating your frame serial number. Enter your serial number prefix (such as BZBF) in the search box to find related downloads or parts catalogs. 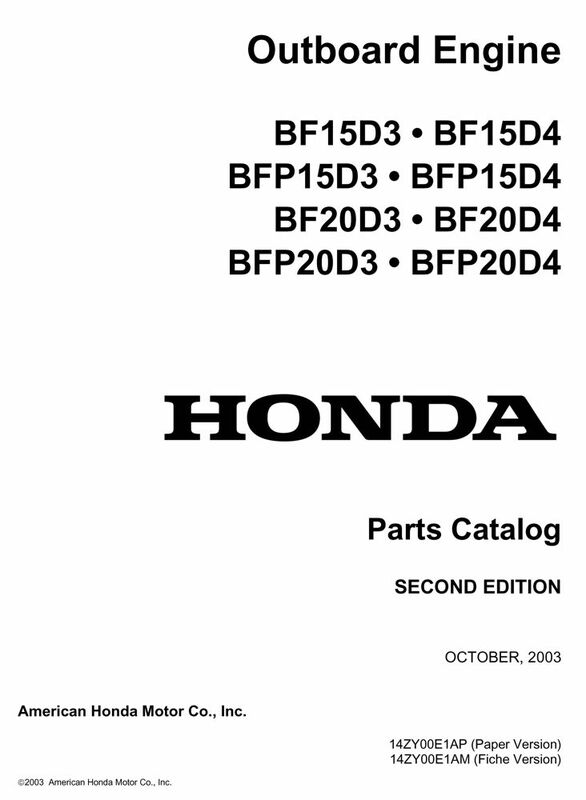 The Honda BF4A, BF5D, BF6A Marine Outboard Shop Manual covers service and repair procedures for the BF4A, BF5D, and BF6A outboard engines. See FAQs for assistance in locating your frame serial number. Enter your serial number prefix (such as BACC) in the search box to find related downloads or parts catalogs. 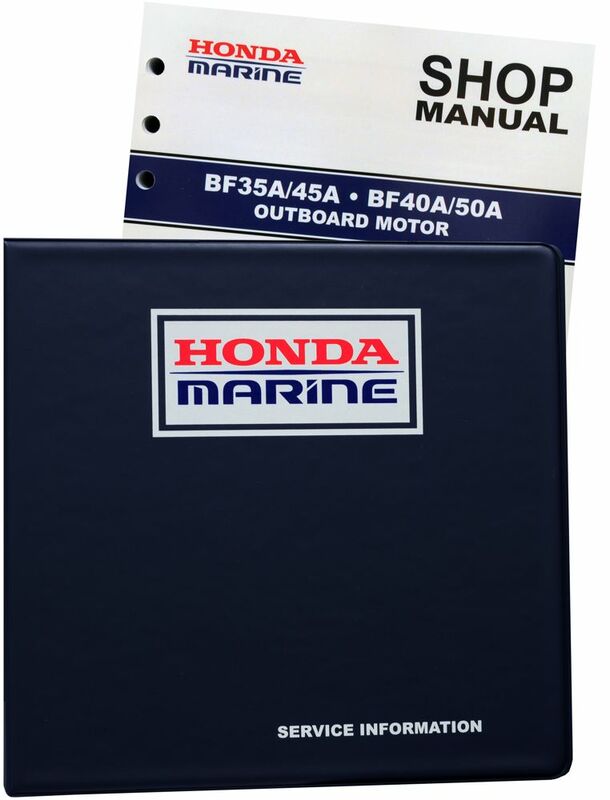 The Honda BF50, BF5A Marine Outboard Shop Manual covers service and repair procedures for the BF50 (5hp) and BF5A outboard engines. See FAQs for assistance in locating your frame serial number. 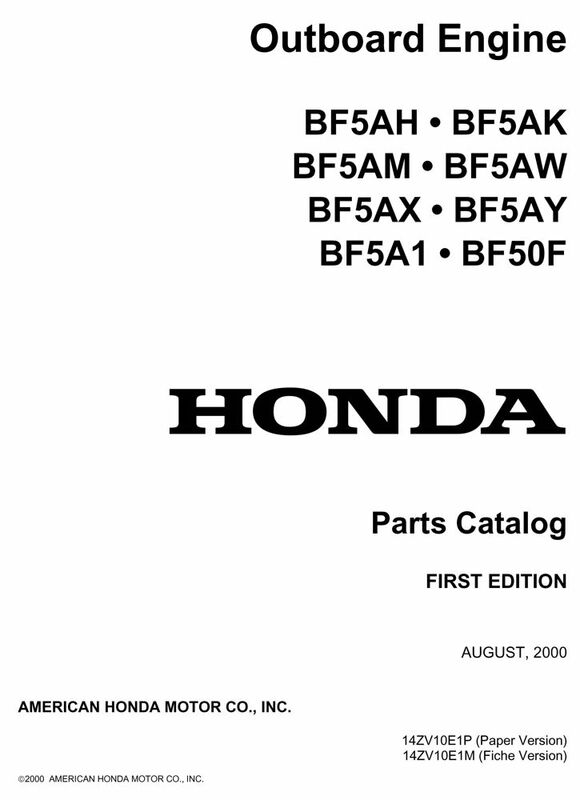 Enter your serial number prefix (such as BF50S) in the search box to find related downloads or parts catalogs. 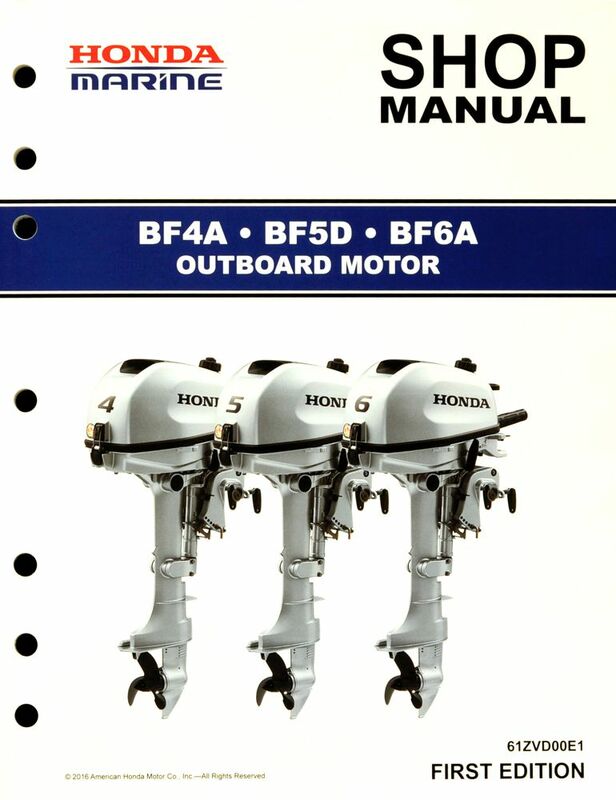 The Honda B75 Marine Outboard Shop Manual covers service and repair procedures for the B75 (7.5hp) outboard engine. See FAQs for assistance in locating your frame serial number. Enter your serial number prefix (such as B75) in the search box to find related downloads or parts catalogs. 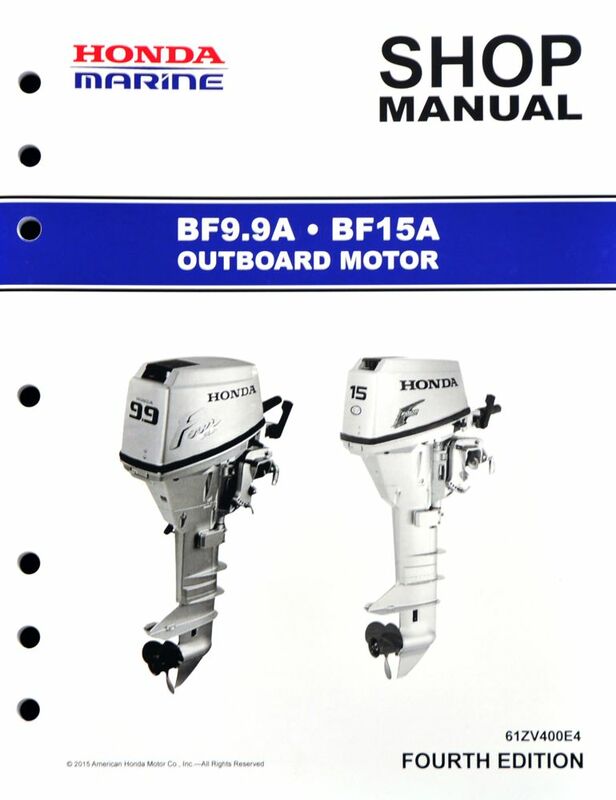 The Honda BF75, BF100, BF8A Marine Outboard Shop Manual covers service and repair procedures for the BF75 (7.5hp), BF100 (10hp), and BF8A outboard engines. See FAQs for assistance in locating your frame serial number. Enter your serial number prefix (such as BF75) in the search box to find related downloads or parts catalogs. 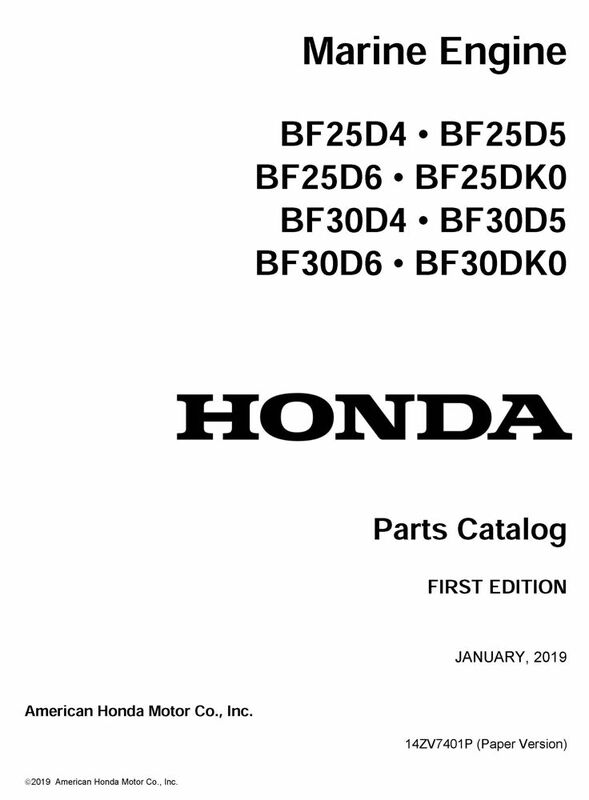 The Honda BF15D, BF20D Marine Outboard Shop Manual covers service and repair procedures for the BF15D, BFP15D, BF20D, and BFP20D outboard engines. See FAQs for assistance in locating your frame serial number. Enter your serial number prefix (such as BALJ) in the search box to find related downloads or parts catalogs. 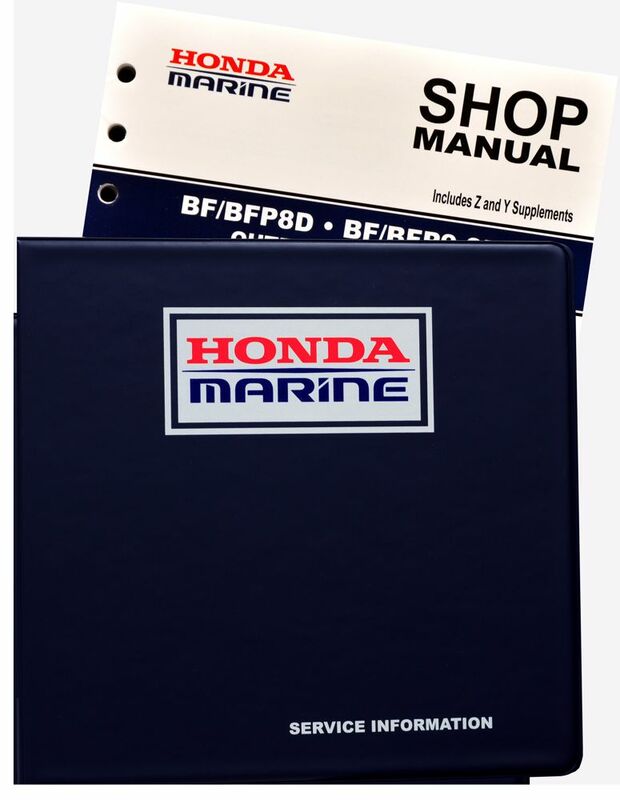 The Honda BF25A, BF30A, BF25D, BF30D Marine Outboard Shop Manual covers service and repair procedures for the BF25A, BF30A, BF25D, and BF30D marine engines. See FAQs for assistance in locating your frame serial number. Enter your serial number prefix (such as BAJL) in the search box to find related downloads or parts catalogs. 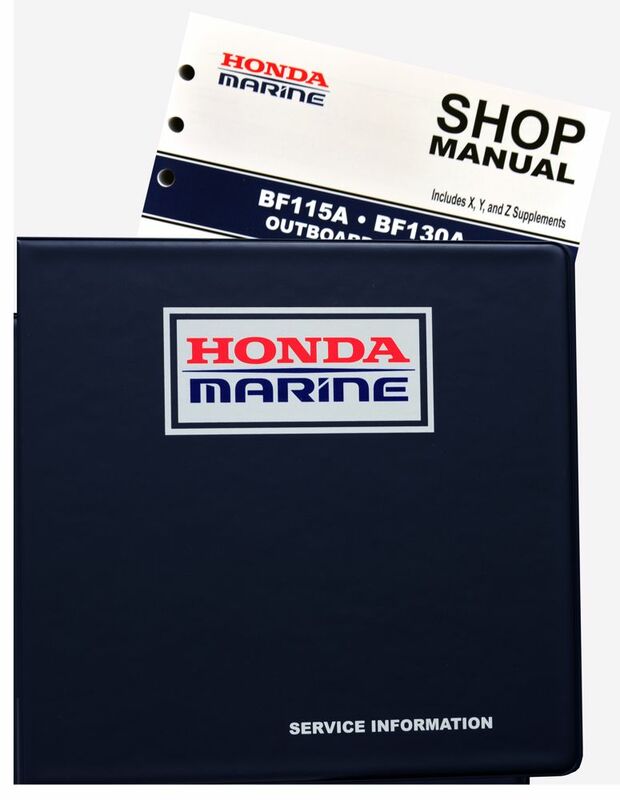 The Honda BF35A, BF40A, BF45A, BF50A Marine Outboard Shop Manual covers service and repair procedures for the BF35A, BF40A, BF45A, and BF50A marine engines. See FAQs for assistance in locating your frame serial number. Enter your serial number prefix (such as BLAG) in the search box to find related downloads or parts catalogs. 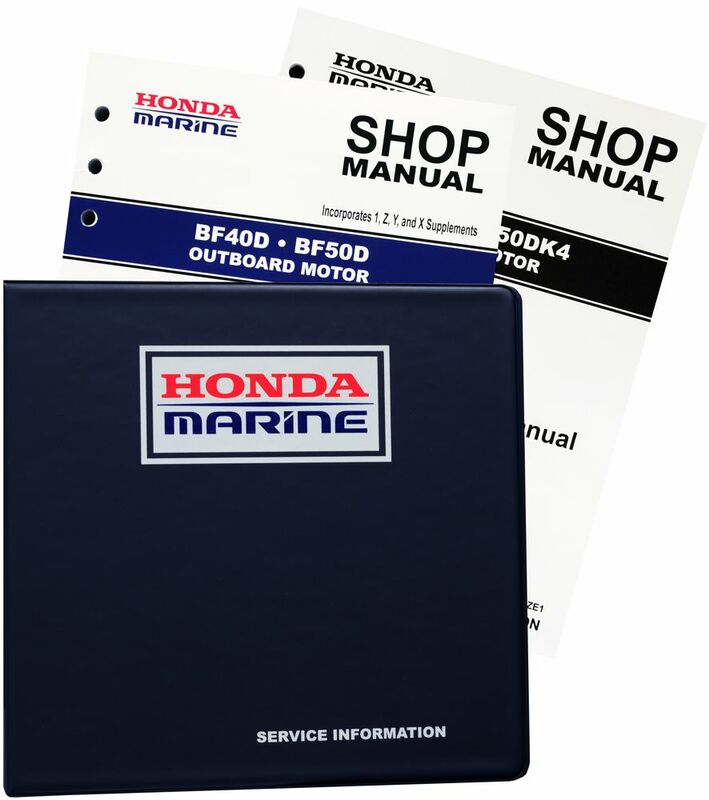 The Honda BF40D, BF50D Marine Outboard Shop Manual covers service and repair procedures for the BF40D and BF50D marine engines. See FAQs for assistance in locating your frame serial number. Enter your serial number prefix (such as BBDJ) in the search box to find related downloads or parts catalogs. 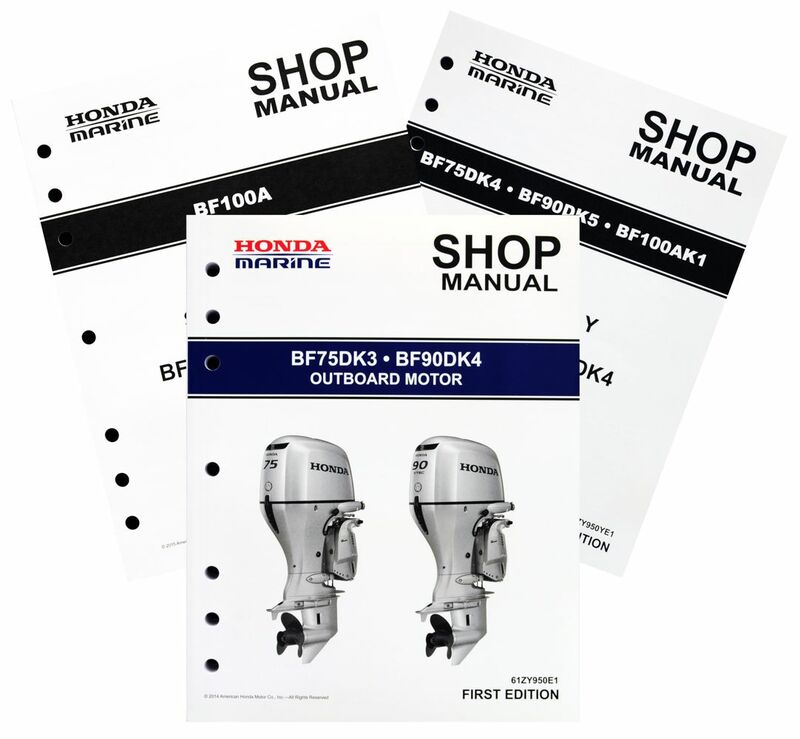 The Honda BF60A Marine Outboard Shop Manual covers service and repair procedures for the BF60A and BFP60A marine engines. See FAQs for assistance in locating your frame serial number. Enter your serial number prefix (such as BBFJ) in the search box to find related downloads or parts catalogs. 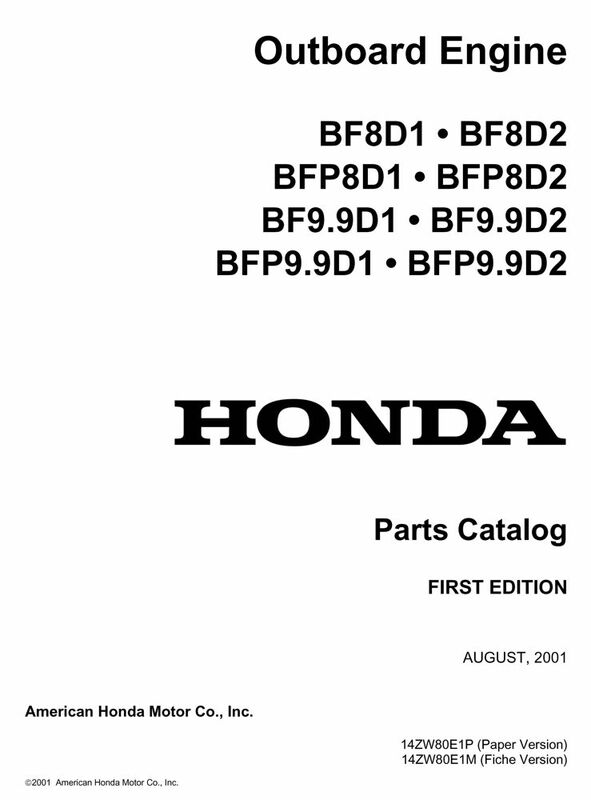 The Honda BF8D, BFP8D, BF9.9D, BFP9.9D Marine Outboard Shop Manual covers service and repair procedures for the BF8D, BFP8D, BF9.9D, and BFP9.9D outboard engines. See FAQs for assistance in locating your frame serial number. Enter your serial number prefix (such as BAAJ) in the search box to find related downloads or parts catalogs. 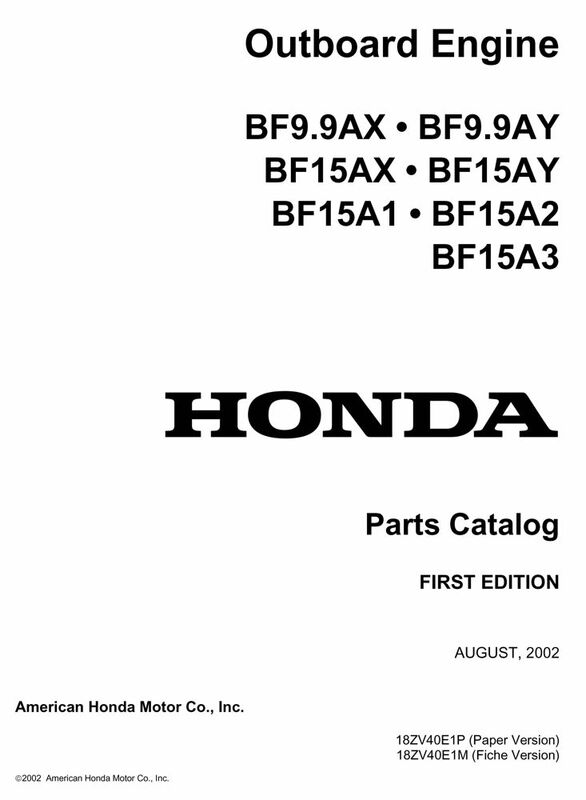 The Honda BF9.9A, BF15A Marine Outboard Shop Manual covers service and repair procedures for the BF9.9A and BF15A outboard engines. See FAQs for assistance in locating your frame serial number. Enter your serial number prefix (such as BABL) in the search box to find related downloads or parts catalogs. 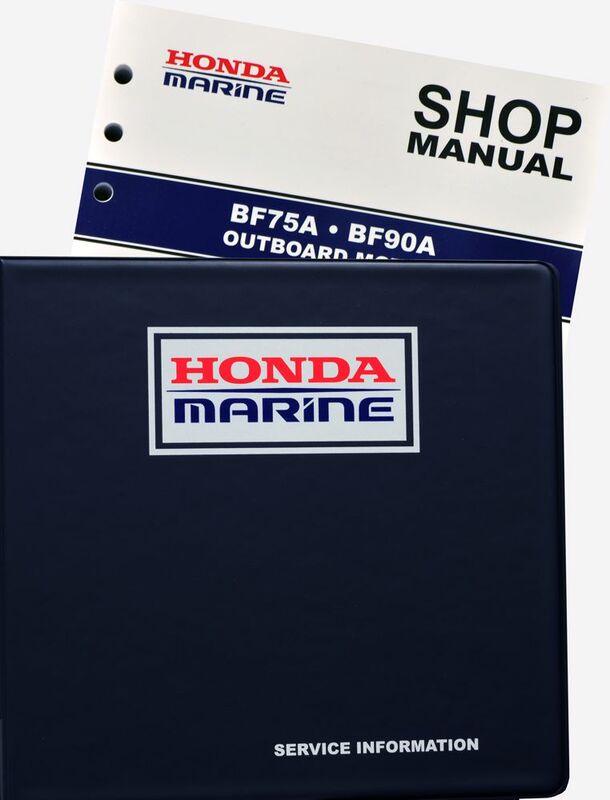 The Honda BF75A, BF90A Marine Outboard Shop Manual covers service and repair procedures for the BF75A and BF90A marine engines. See FAQs for assistance in locating your frame serial number. Enter your serial number prefix (such as BBAL) in the search box to find related downloads or parts catalogs. 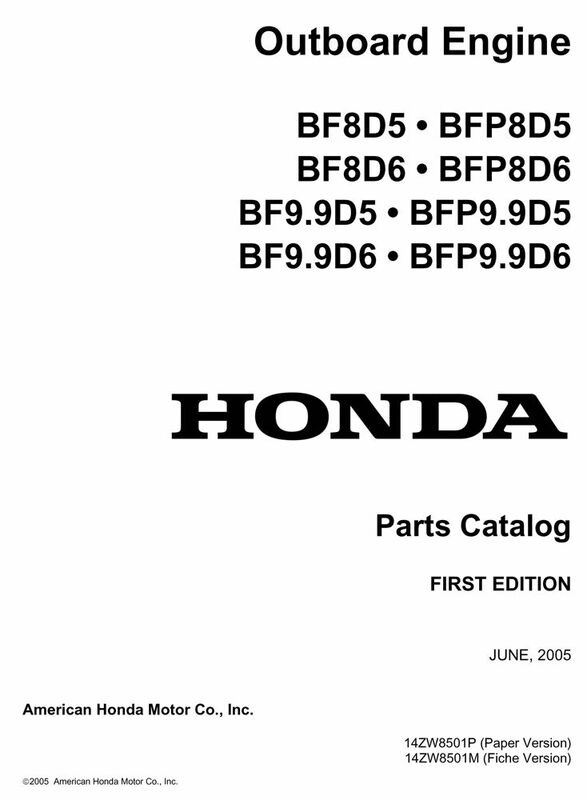 The Honda BF75DK3, BF90DK4 Marine Outboard Shop Manual and BF100A supplement cover service and repair procedures for the BF75DK3, BF90DK4, and BF100A marine engines. See FAQs for assistance in locating your frame serial number. Enter your serial number prefix (such as BBAJ) in the search box to find related downloads or parts catalogs. 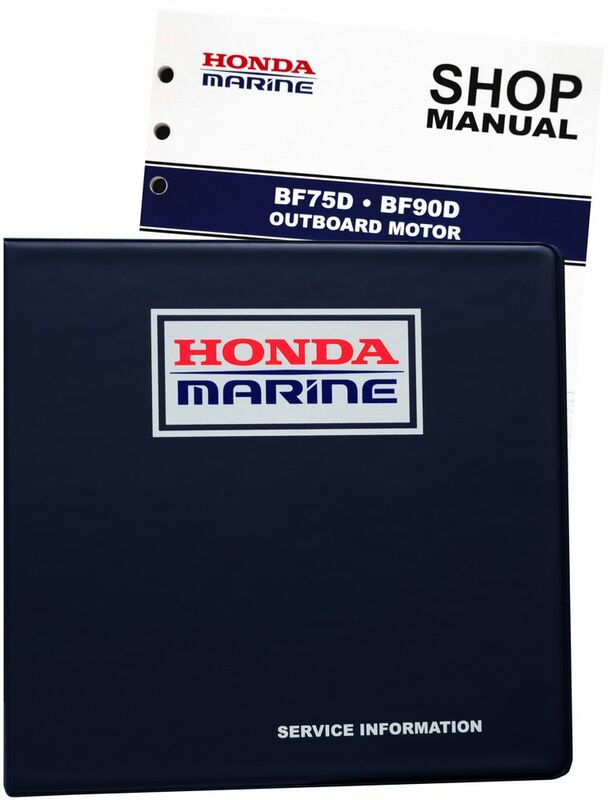 The Honda BF75D, BF90D Marine Outboard Shop Manual covers service and repair procedures for the BF75D and BF90D marine engines. See FAQs for assistance in locating your frame serial number. 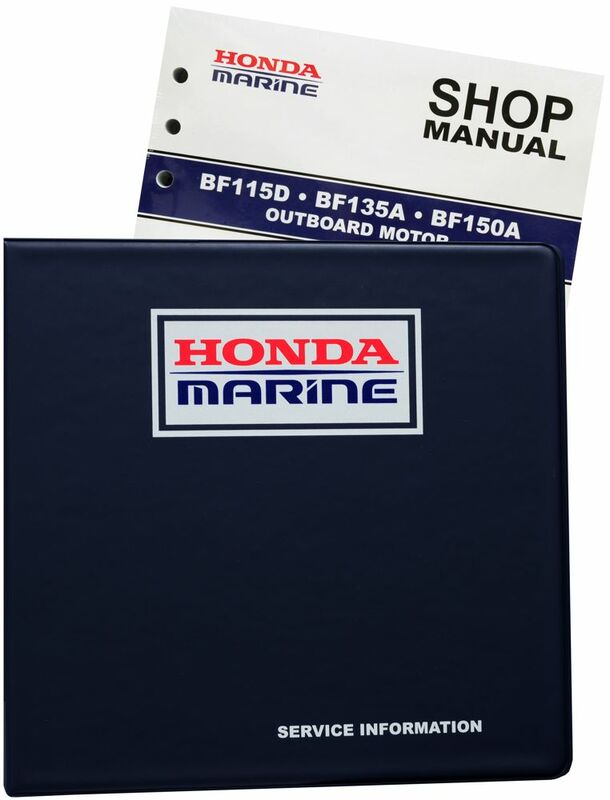 The Honda BF115A, BF130A Marine Outboard Shop Manual covers service and repair procedures for the BF115A and BF130A marine engines. See FAQs for assistance in locating your frame serial number. Enter your serial number prefix (such as BZBD) in the search box to find related downloads or parts catalogs. 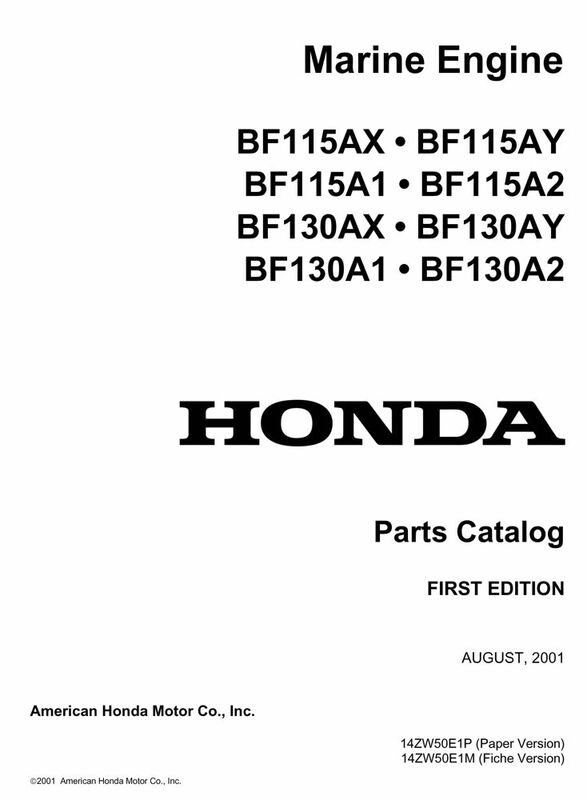 The Honda BF115D, BF135A, BF150A Marine Outboard Shop Manual covers service and repair procedures for the BF115D, BF135A, and BF150A marine engines. See FAQs for assistance in locating your frame serial number. 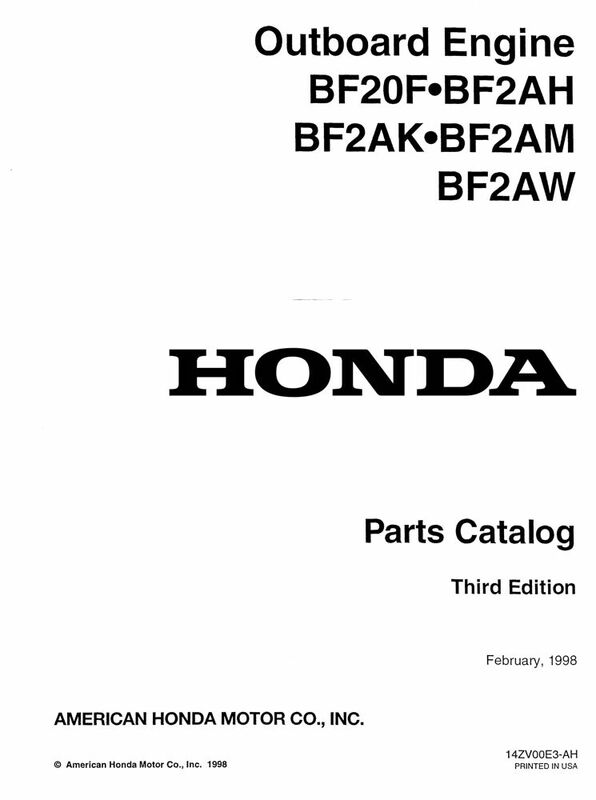 Enter your serial number prefix (such as BBHJ) in the search box to find related downloads or parts catalogs. 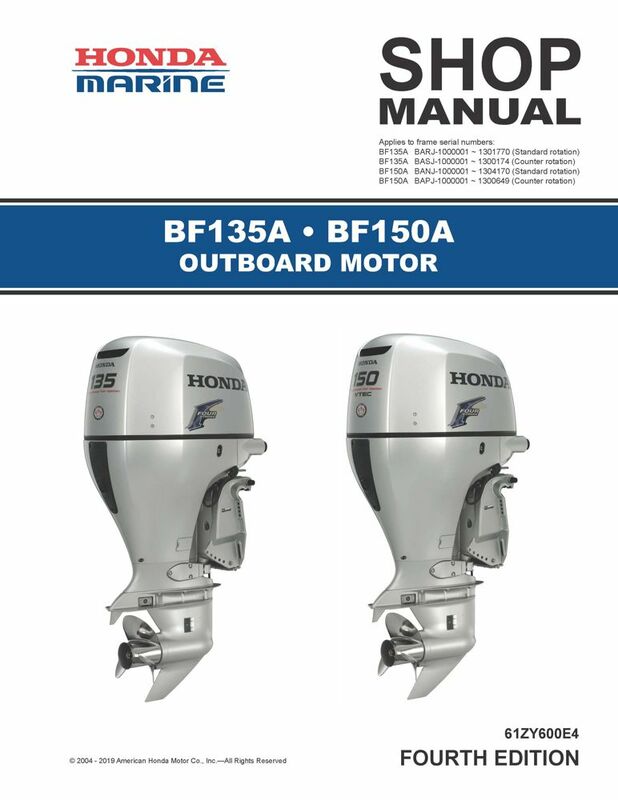 The Honda BF135A, BF150A Marine Outboard Shop Manual covers service and repair procedures for the BF135A and BF150A marine engines. See FAQs for assistance in locating your frame serial number. Enter your serial number prefix (such as BARJ) in the search box to find related downloads or parts catalogs. 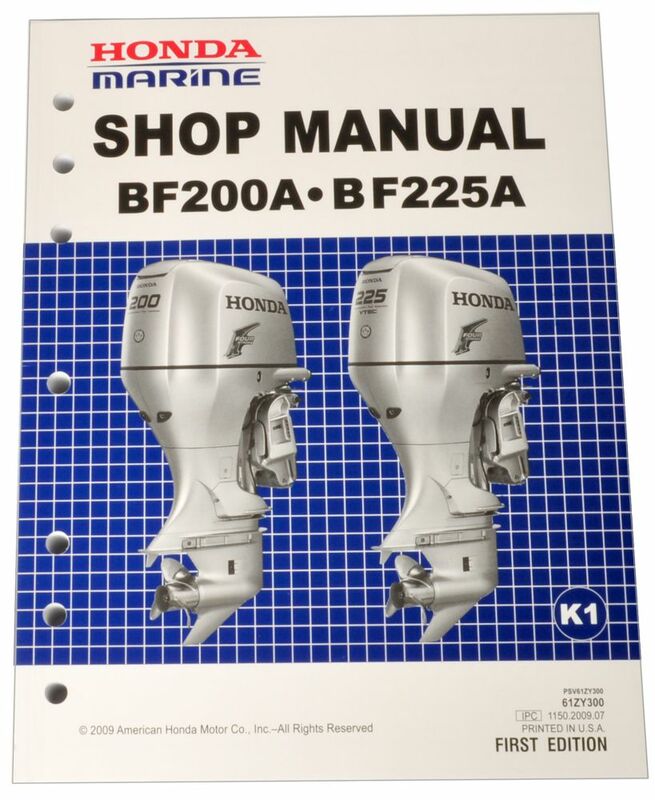 The Honda BF200A, BF225A Marine Outboard Shop Manual covers service and repair procedures for the BF200A and BF225A A2 through K0 marine engines. See FAQs for assistance in locating your frame serial number. Enter your serial number prefix (such as BAEJ) in the search box to find related downloads or parts catalogs. 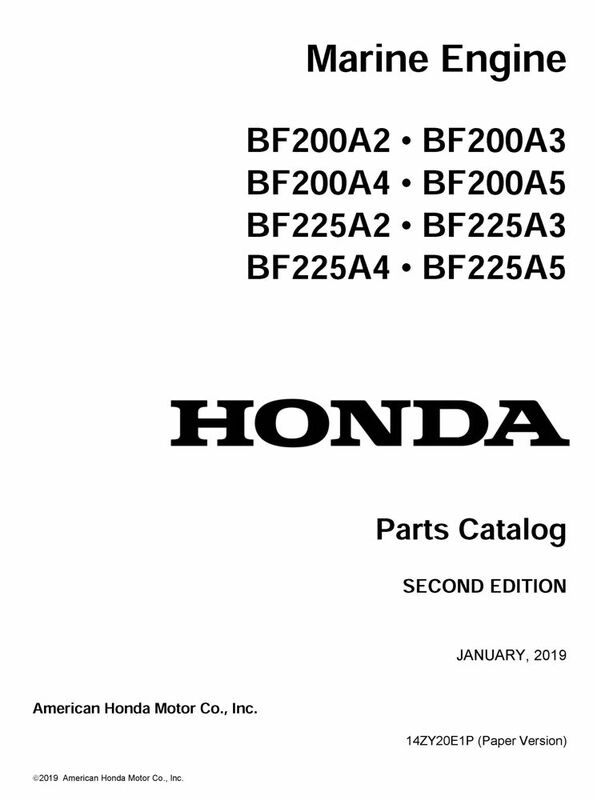 The Honda BF200A, BF225A Marine Outboard Shop Manual covers service and repair procedures for the BF200AK1/K2 and BF225AK1/K2 marine engines. See FAQs for assistance in locating your frame serial number. 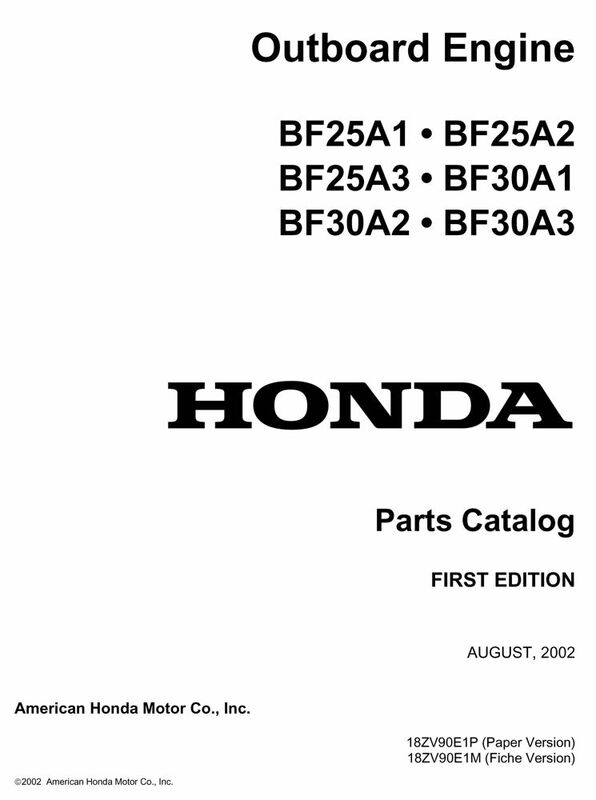 The Honda BF200A, BF225A Marine Outboard Shop Manual covers service and repair procedures for the BF200AK3 and BF225AK3 marine engines. See FAQs for assistance in locating your frame serial number. 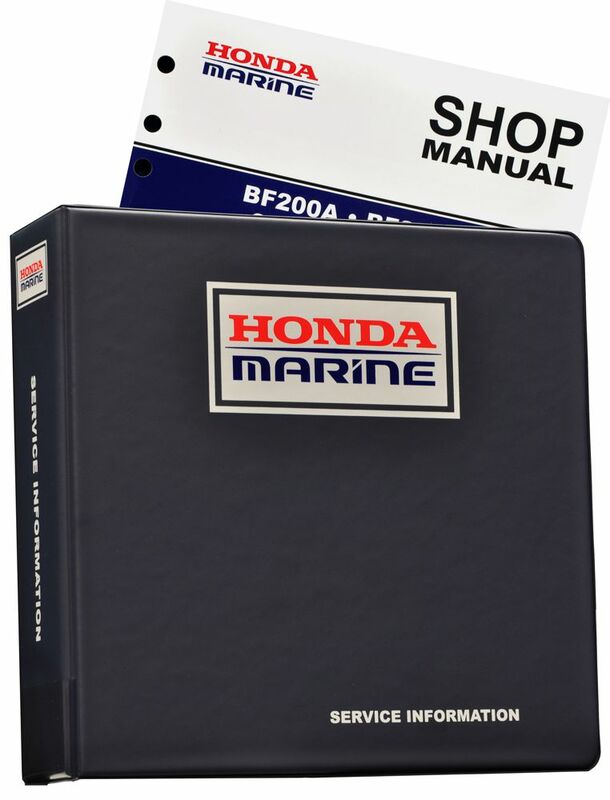 The Honda BF250A Marine Outboard Shop Manual covers service and repair procedures for the BF250A marine engine. See FAQs for assistance in locating your frame serial number. Enter your serial number prefix (such as BBJJ) in the search box to find related downloads or parts catalogs. Fully illustrated color poster in PDF format. Your Honda Marine engine is designed and manufactured to precise specifications to ensure years of trouble-free operation. This includes the fuel system. This consumer handout outlines steps you can take to avoid fuel-related problems. Your Honda Marine engine is designed and manufactured to precise specifications to ensure years of trouble-free operation. This includes the fuel system. However, the properties of gasoline can quickly lead to stale fuel causing starting or running problems and, in some cases, damage to the fuel system if precautions are not followed. 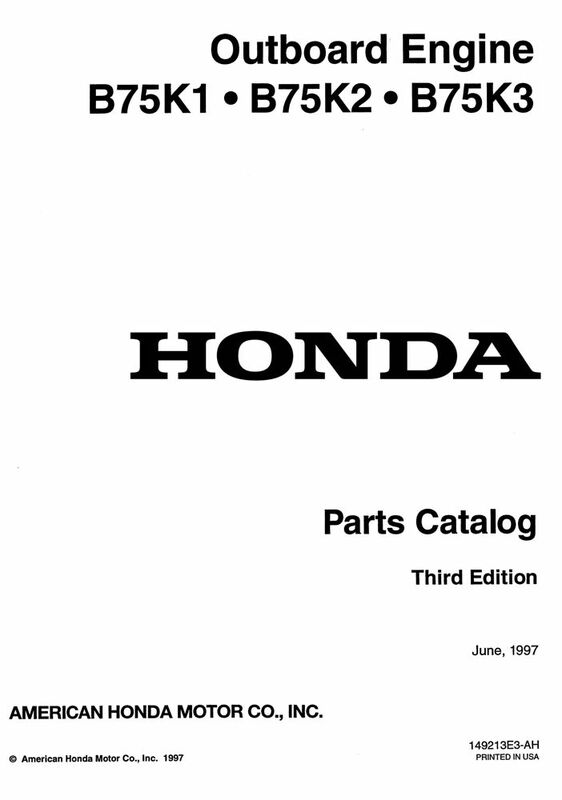 Paper parts catalog for the B75K1, B75K2, and B75K3 Marine Outboard Motors. See FAQs for assistance in locating your frame serial number. Enter your serial number prefix (such as B75) in the search box to locate applicable shop manuals, parts catalogs, and free downloads. 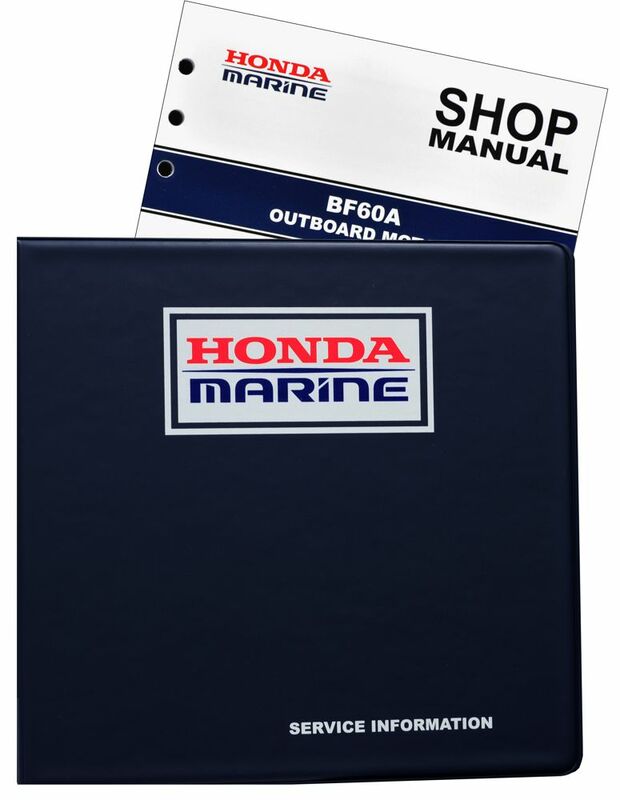 Don't forget your Honda Marine binder to keep all your service publications organized—just click on Storage. 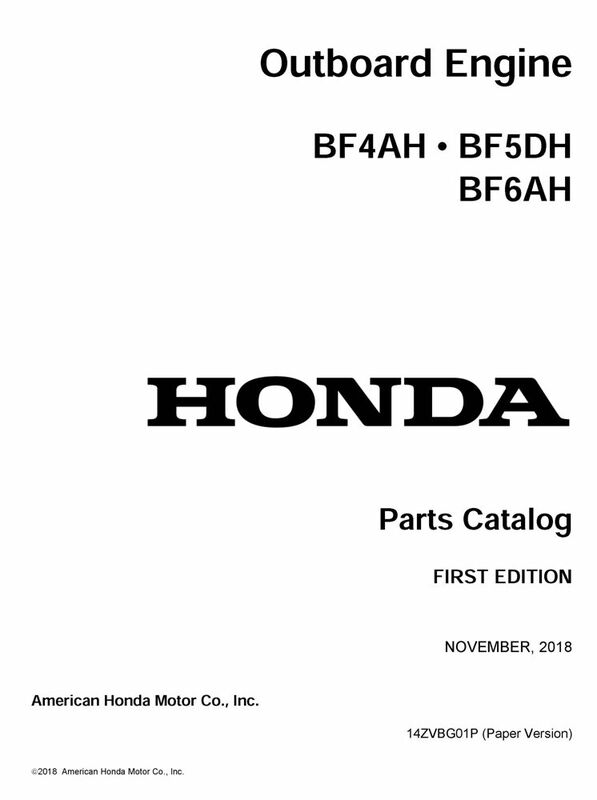 Honda does not sell parts directly. 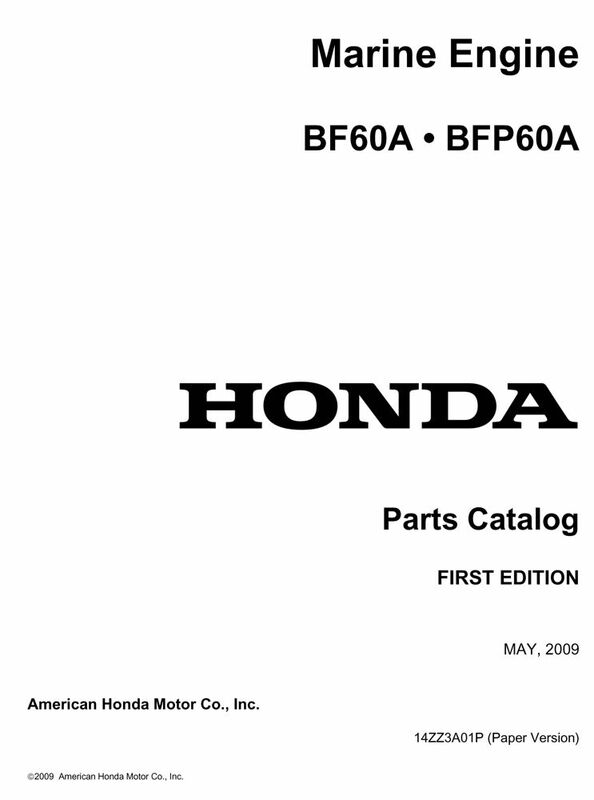 Honda Power Equipment Parts are available to purchase at any authorized Honda dealer. Parts availability may be limited or nonexistent for older, discontinued models. 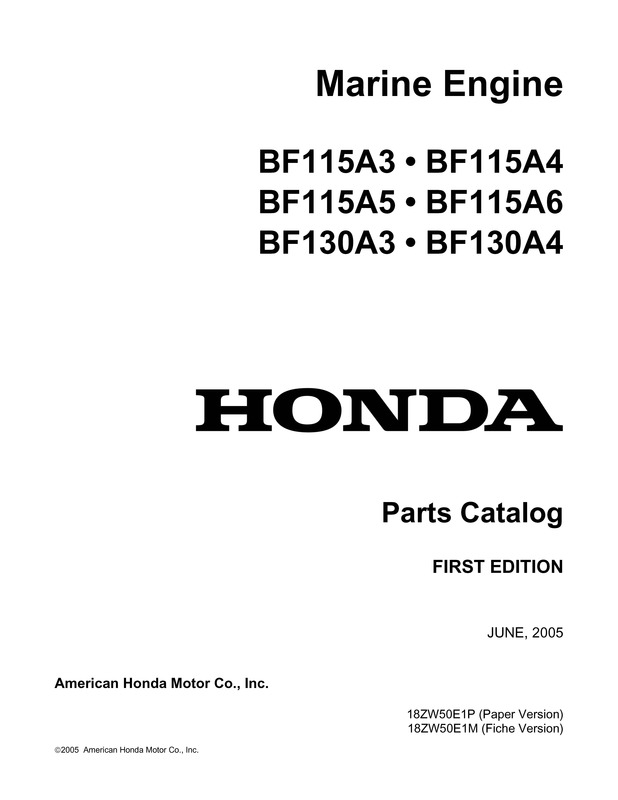 Paper parts catalog for the BF115A3, BF115A4, BF115A5, BF115A6, BF130A3, and BF130A4 Marine Outboard Motors. See FAQs for assistance in locating your frame serial number. Enter your serial number prefix (such as BBBB) in the search box to locate applicable shop manuals, parts catalogs, and free downloads. 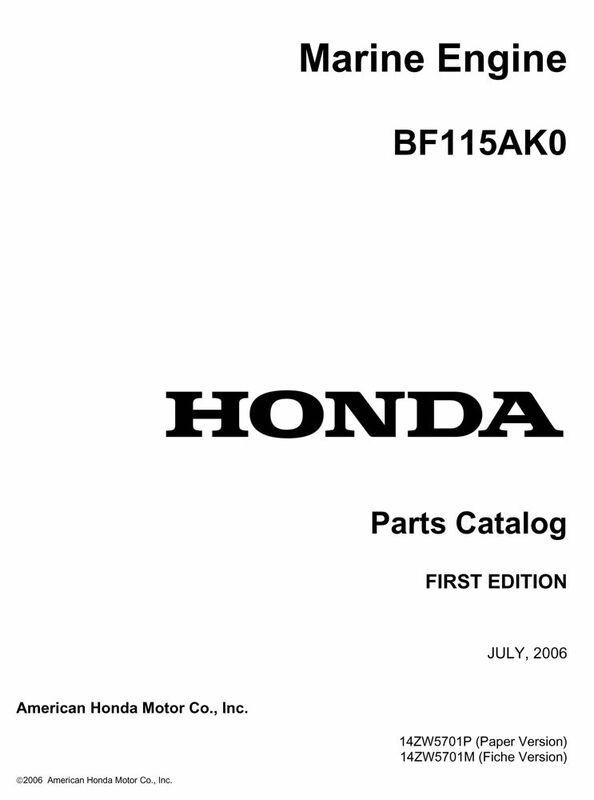 Paper parts catalog for the BF115AK0 Marine Outboard Motor. See FAQs for assistance in locating your frame serial number. 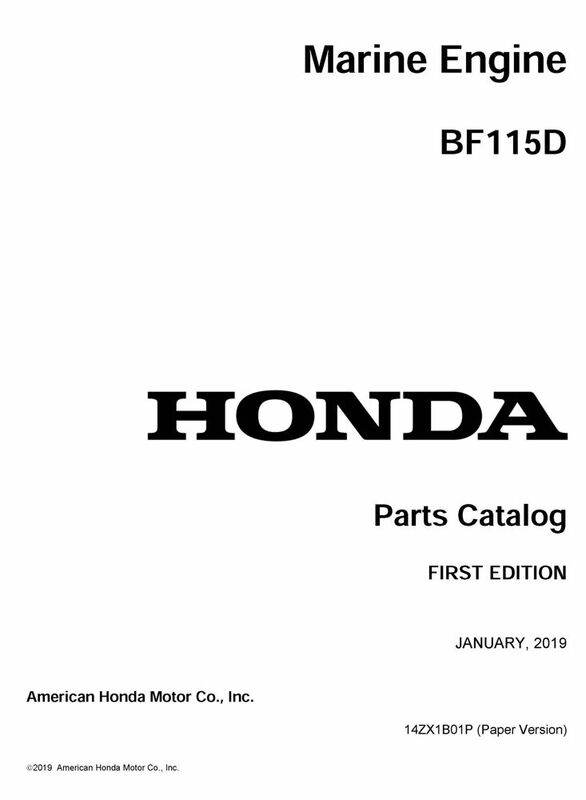 Paper parts catalog for the BF115AX, BF115AY, BF115A1, BF115A2, BF130AX, BF130AY, BF130A1, and BF130A2 Marine Outboard Motors. See FAQs for assistance in locating your frame serial number. 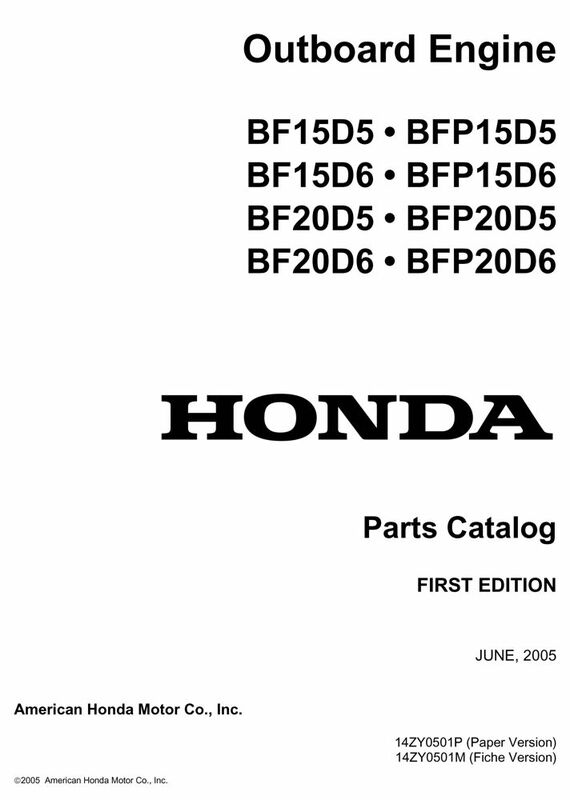 Paper parts catalog for the BF115D Marine Outboard Motor. See FAQs for assistance in locating your frame serial number. 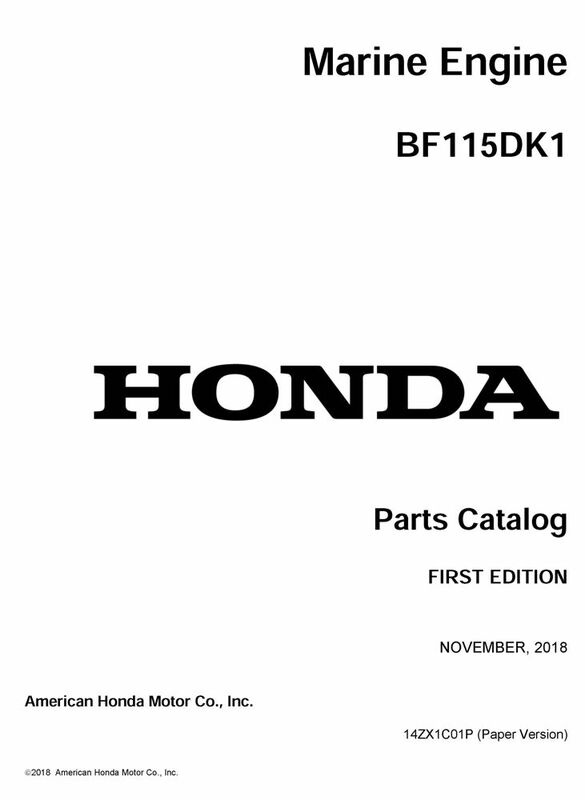 Paper parts catalog for the BF115DK1 Marine Outboard Motor. See FAQs for assistance in locating your frame serial number. 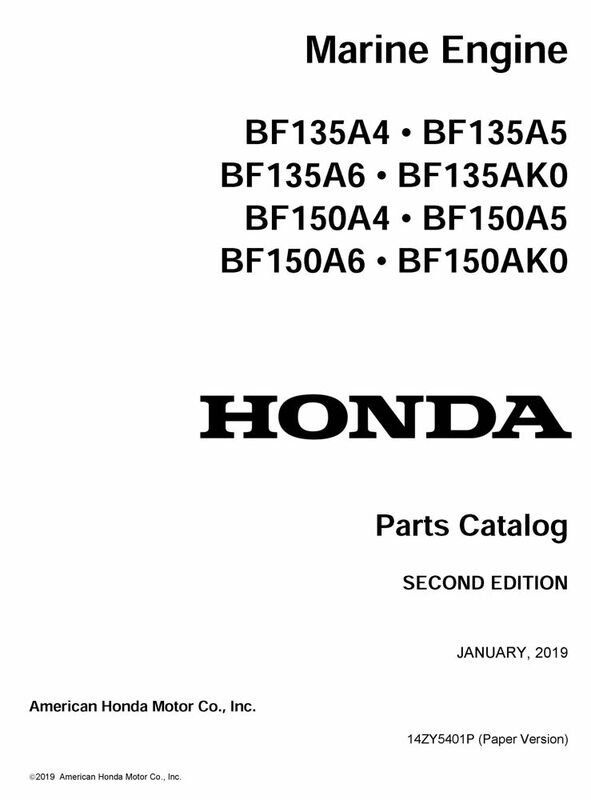 Paper parts catalog for the BF135A4, BF135A5, BF135A6, BF135AK0, BF150A4, BF150A5, BF150A6, and BF150AK0 Marine Outboard Motors. See FAQs for assistance in locating your frame serial number. 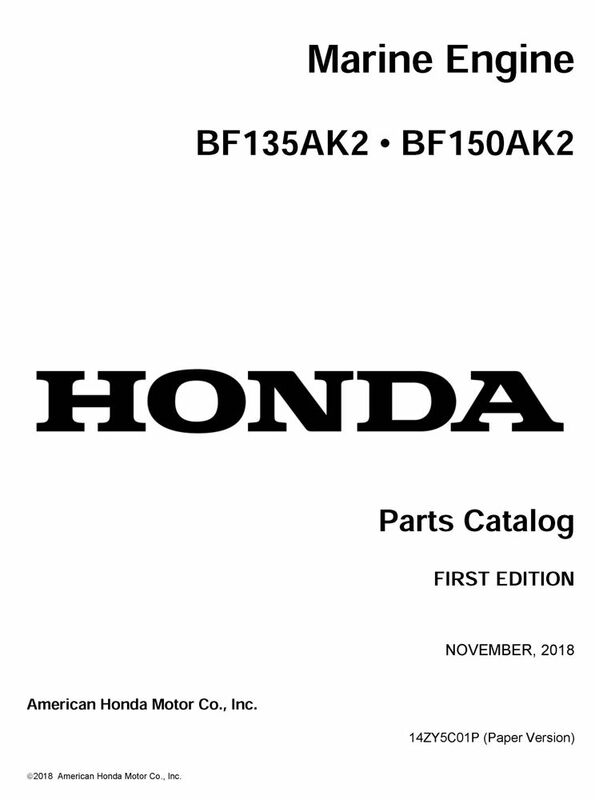 Paper parts catalog for the BF135AK2 and BF150AK2 Marine Outboard Motors. See FAQs for assistance in locating your frame serial number. Paper parts catalog for the BF15D3, BFP15D3, BF15D4, BFP15D4, BF20D3, BFP20D3, BF20D4, and BFP20D4 Marine Outboard Motors. See FAQs for assistance in locating your frame serial number. Paper parts catalog for the BF15D5, BFP15D5, BF15D6, BFP15D6, BF20D5, BFP20D5, BF20D6, and BFP20D6 Marine Outboard Motors. See FAQs for assistance in locating your frame serial number. 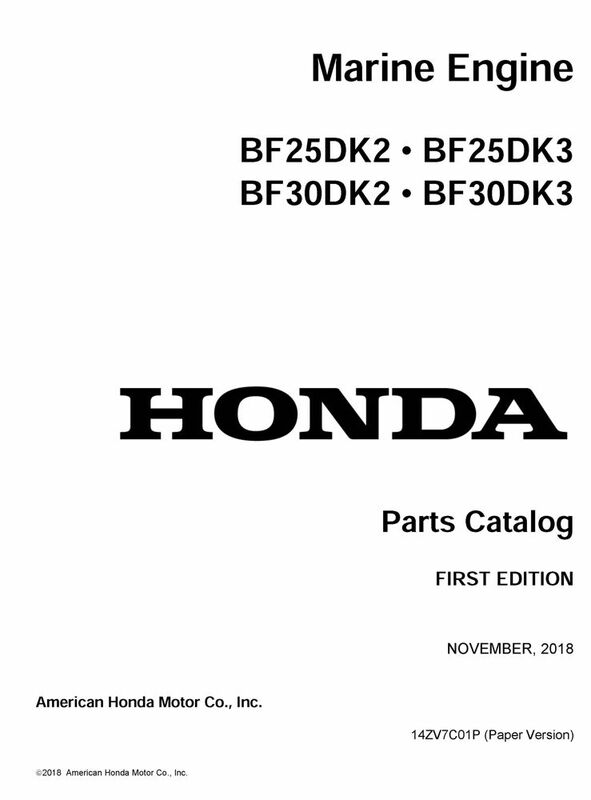 Paper parts catalog for the BF15DK0, BFP15DK0, BF15DK2, BFP15DK2, BF20DK0, BFP20DK0, and BF20DK2 Marine Outboard Motors. See FAQs for assistance in locating your frame serial number. 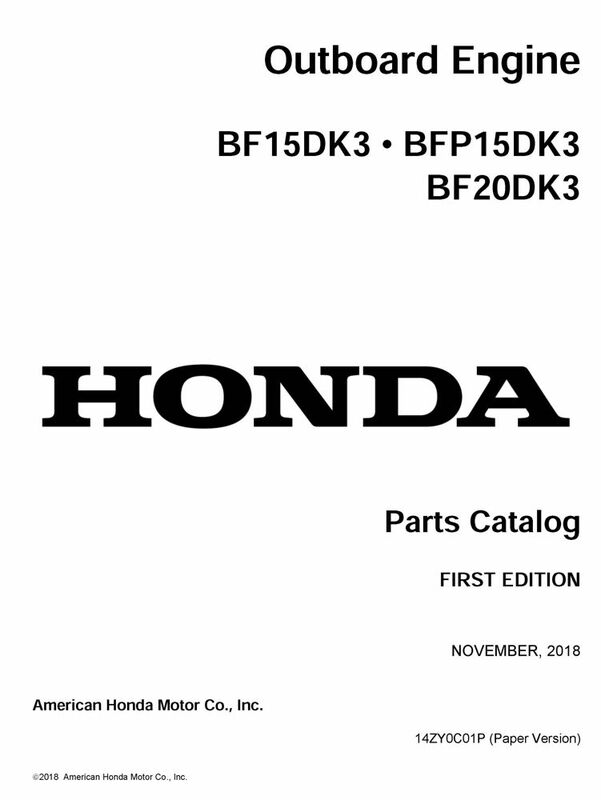 Paper parts catalog for the BF15DK3, BFP15DK3, and BF20DK3 Marine Outboard Motors. See FAQs for assistance in locating your frame serial number. 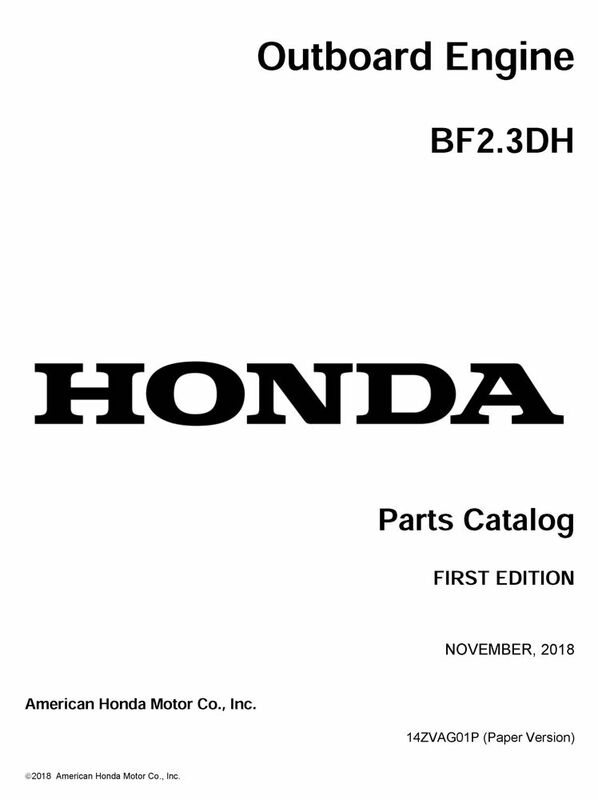 Paper parts catalog for the BF2.3DH Marine Outboard Motor. See FAQs for assistance in locating your frame serial number. 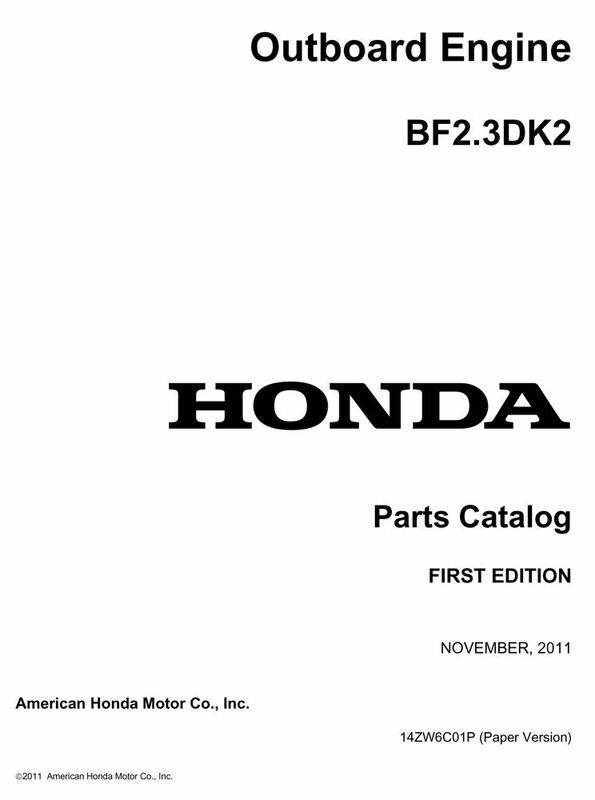 Paper parts catalog for the BF2.3DK2 Marine Outboard Motor. See FAQs for assistance in locating your frame serial number. 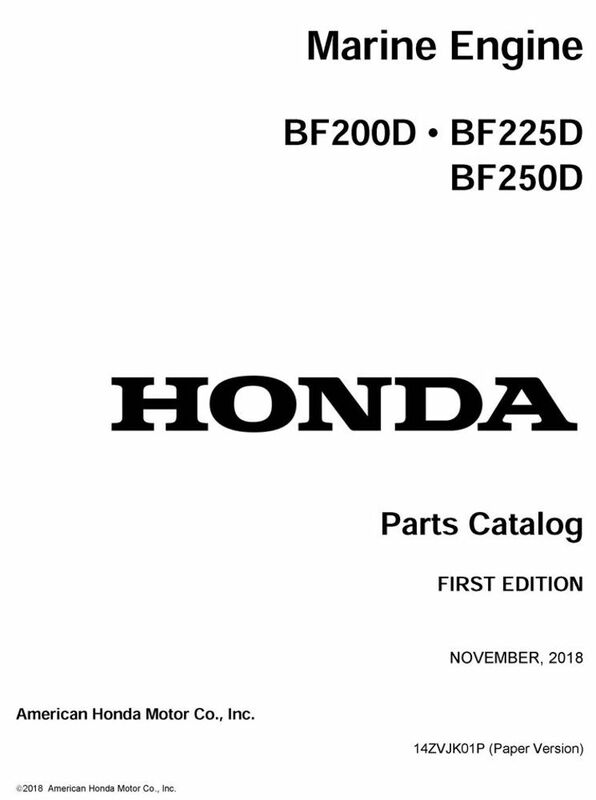 Paper parts catalog for the BF200A2, BF200A3, BF200A4, BF200A5, BF225A2, BF225A3, BF225A4, and BF225A5 Marine Outboard Motors. See FAQs for assistance in locating your frame serial number. Enter your serial number prefix (such as BAEJ) in the search box to locate applicable shop manuals, parts catalogs, and free downloads. 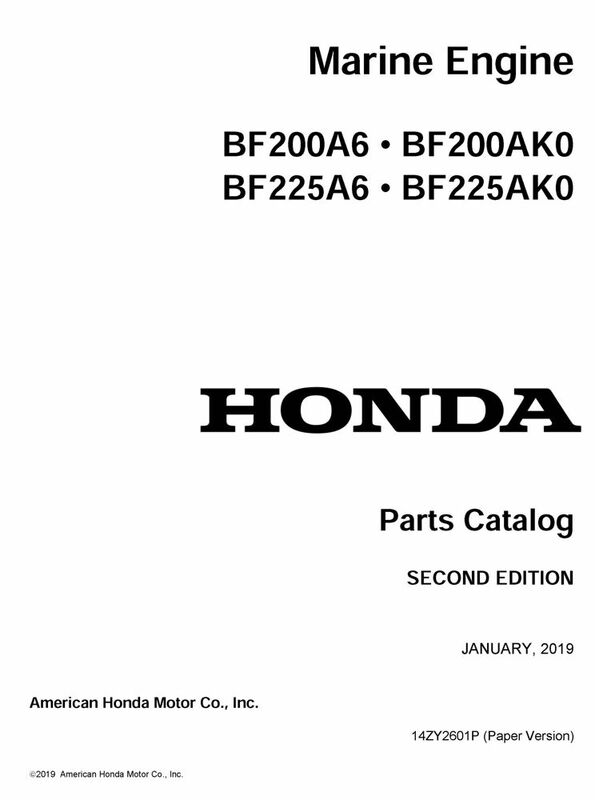 Paper parts catalog for the BF200A6, BF200AK0, BF225A6, and BF225AK0 Marine Outboard Motors. See FAQs for assistance in locating your frame serial number. 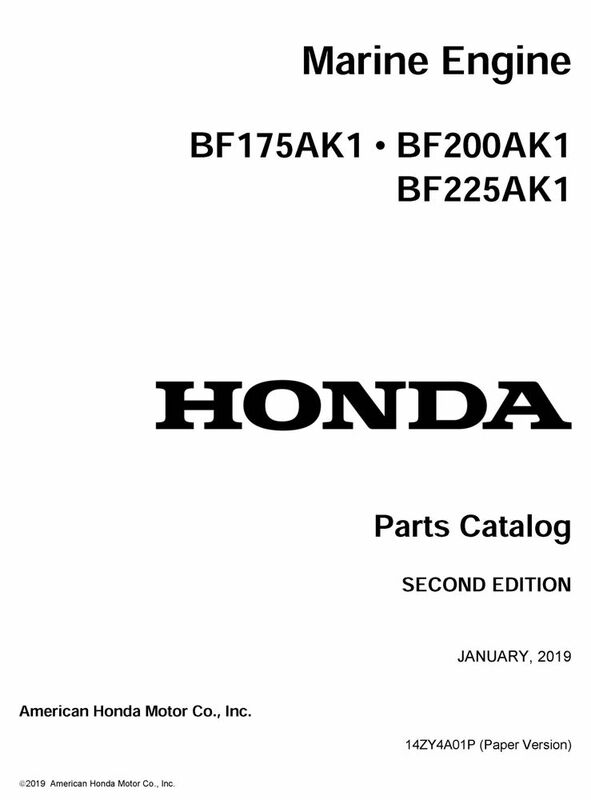 Paper parts catalog for the BF200AK1 and BF225AK1 Marine Outboard Motors. See FAQs for assistance in locating your frame serial number. 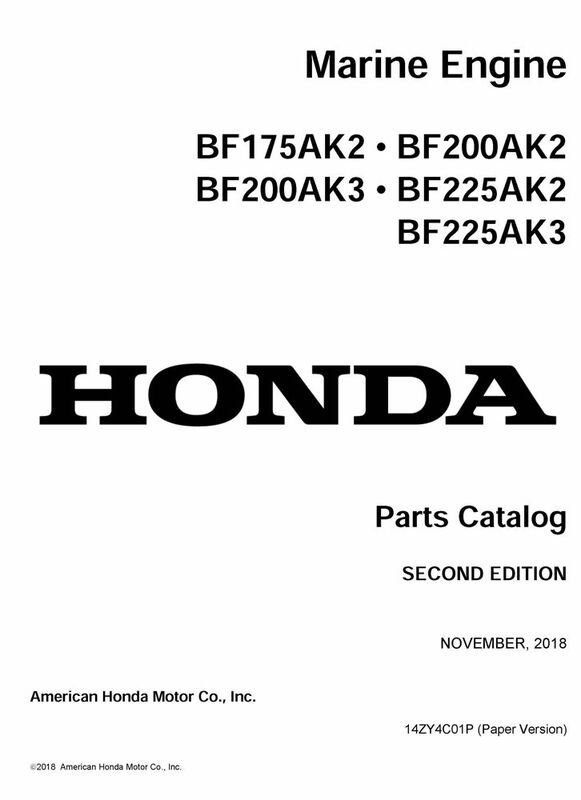 Paper parts catalog for the BF200AK2, BF200AK3, BF225AK2, and BF225AK3 Marine Outboard Motors. See FAQs for assistance in locating your frame serial number. 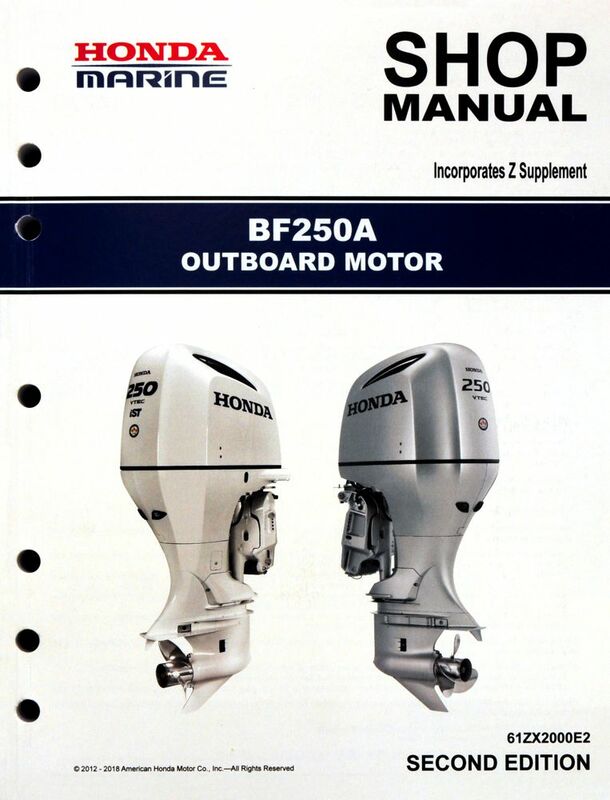 Paper parts catalog for the BF200D, BF225D, and BF250D Marine Outboard Motors. See FAQs for assistance in locating your frame serial number. 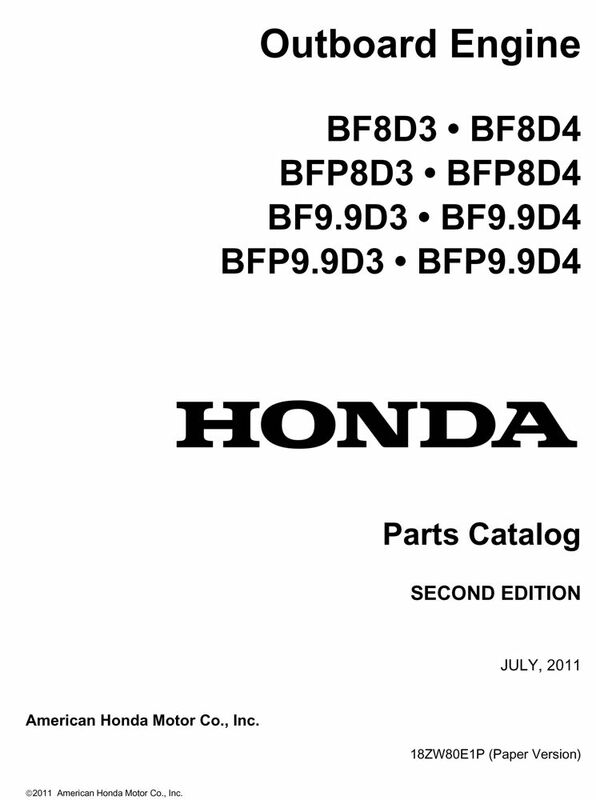 Paper parts catalog for the BF20F, BF2AH, BF2AK, BF2AM, and BF2AW Marine Outboard Motors. See FAQs for assistance in locating your frame serial number. 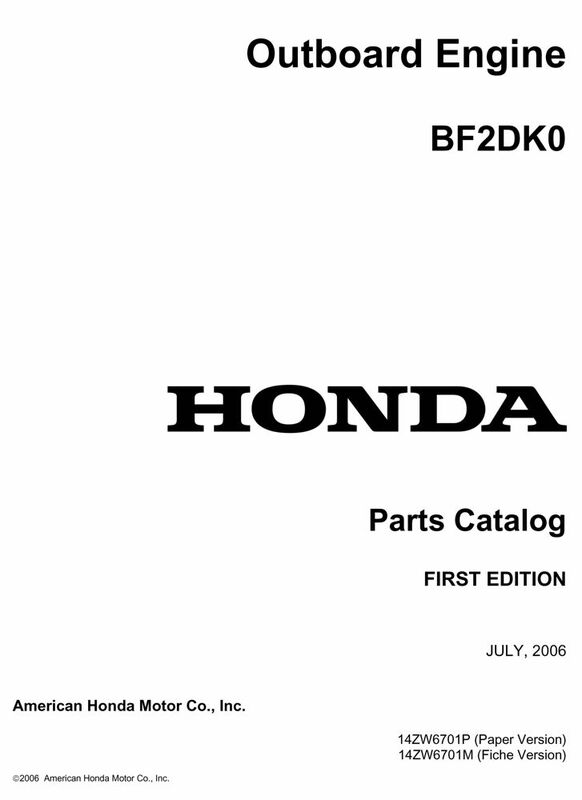 Enter your serial number prefix (such as BF20) in the search box to locate applicable shop manuals, parts catalogs, and free downloads. 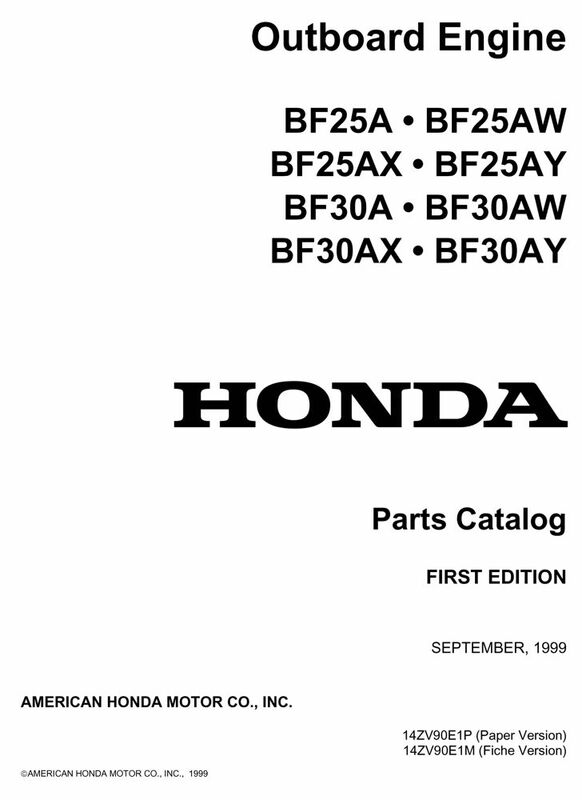 Paper parts catalog for the BF250A Marine Outboard Motor. See FAQs for assistance in locating your frame serial number. 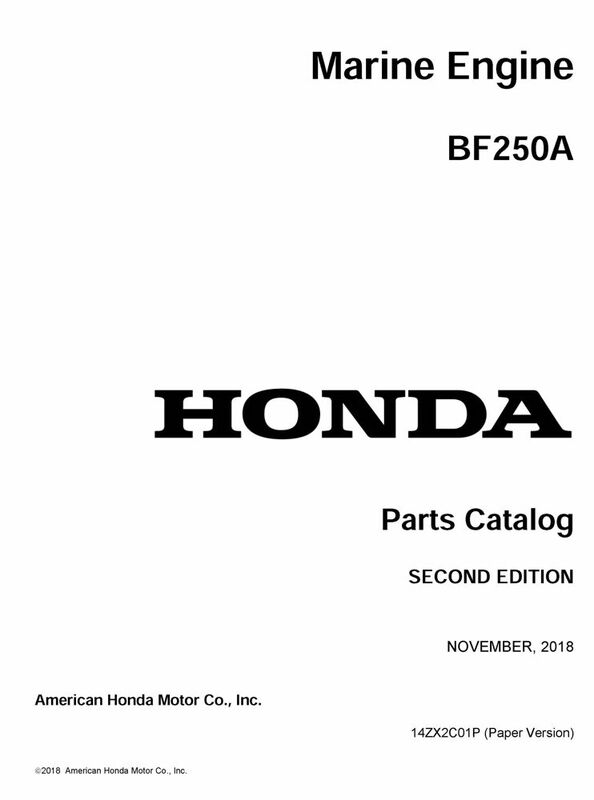 Paper parts catalog for the BF25A, BF25AW, BF25AX, BF25AY, BF30A, BF30AW, BF30AX, and BF30AY Marine Outboard Motors. See FAQs for assistance in locating your frame serial number. 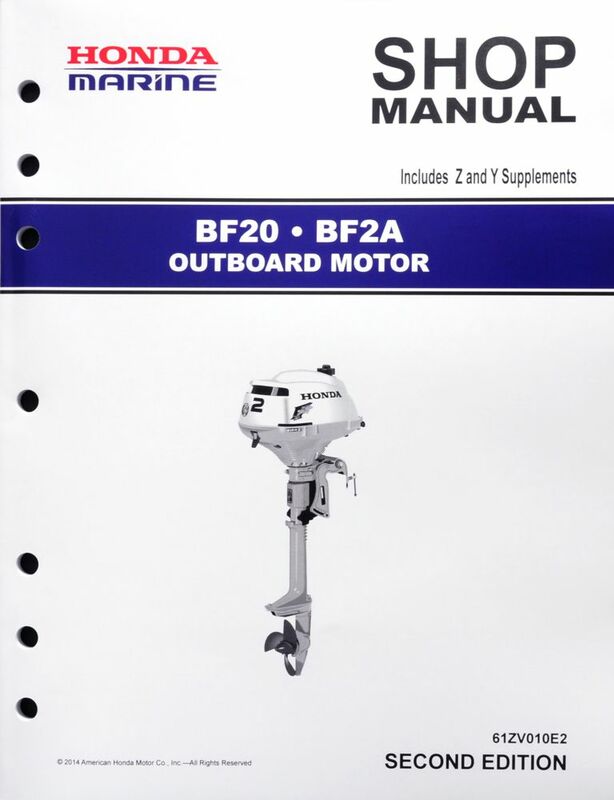 Paper parts catalog for the BF25A1, BF25A2, BF25A3, BF30A1, BF30A2, and BF30A3 Marine Outboard Motors. See FAQs for assistance in locating your frame serial number. 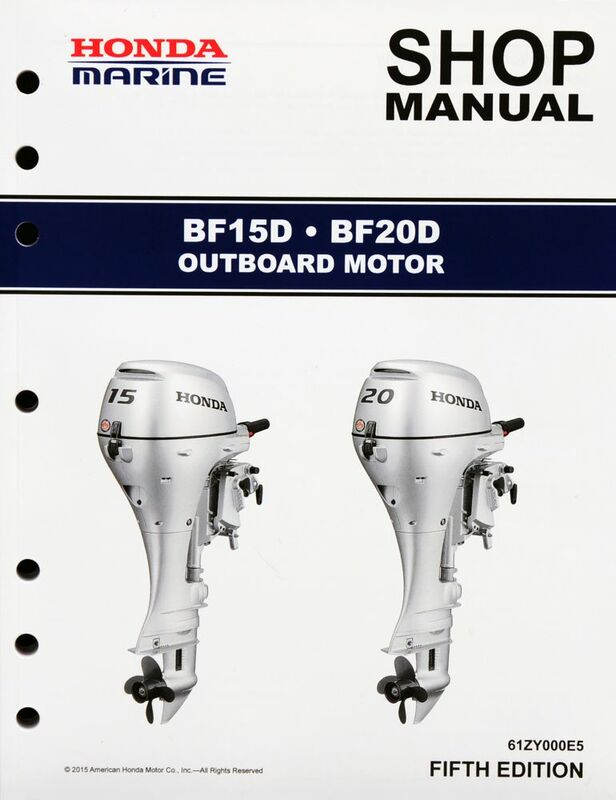 Paper parts catalog for the BF25D4, BF25D5, BF25D6, BF25DK0, BF30D4, BF30D5, BF30D6, and BF30DK0 Marine Outboard Motors. See FAQs for assistance in locating your frame serial number. 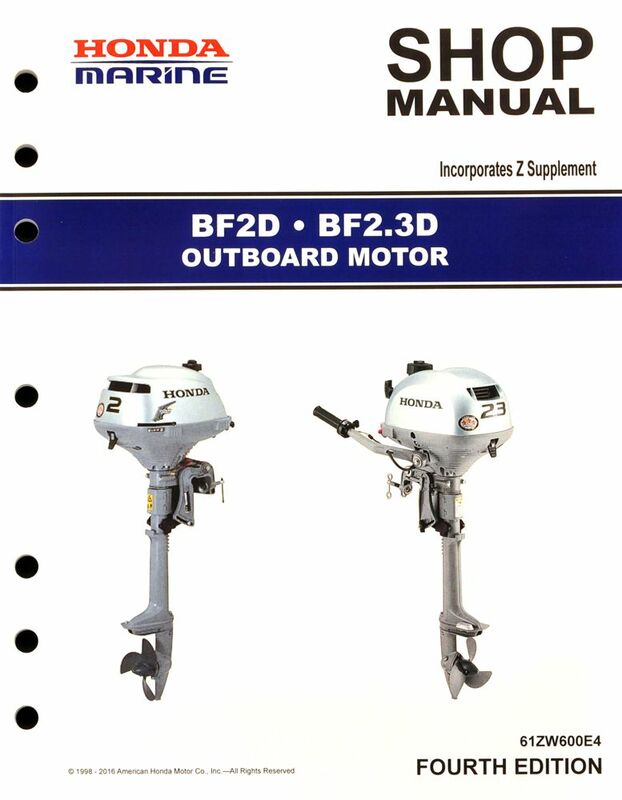 Paper parts catalog for the BF25DK2, BF25DK3, BF30DK2, and BF30DK3 Marine Outboard Motors. See FAQs for assistance in locating your frame serial number. 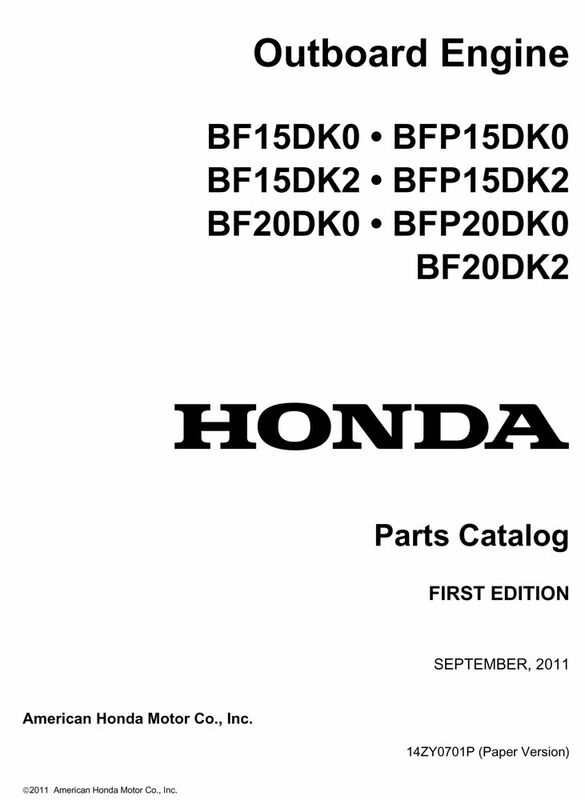 Paper parts catalog for the BF2DK0 Marine Outboard Motor. See FAQs for assistance in locating your frame serial number. 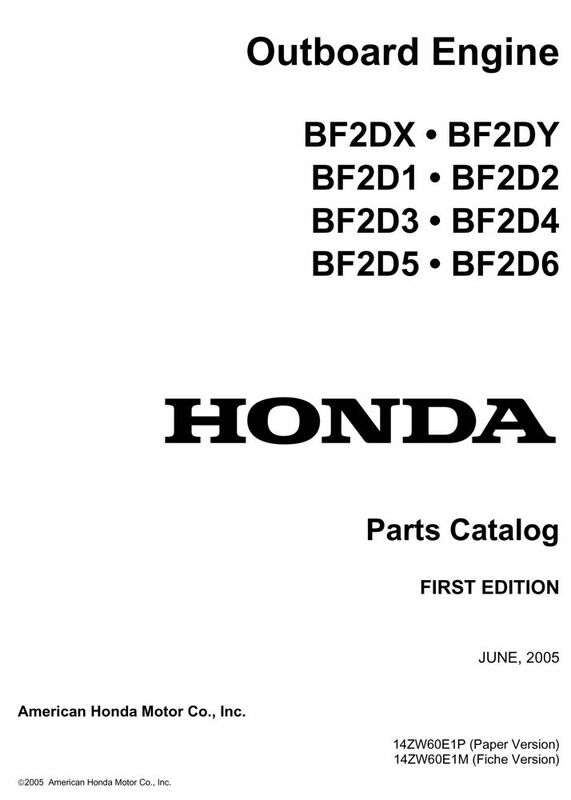 Paper parts catalog for the BF2DX, BF2DY, BF2D1, BF2D2, BF2D3, BF2D4, BF2D5, and BF2D6 Marine Outboard Motors. See FAQs for assistance in locating your frame serial number. 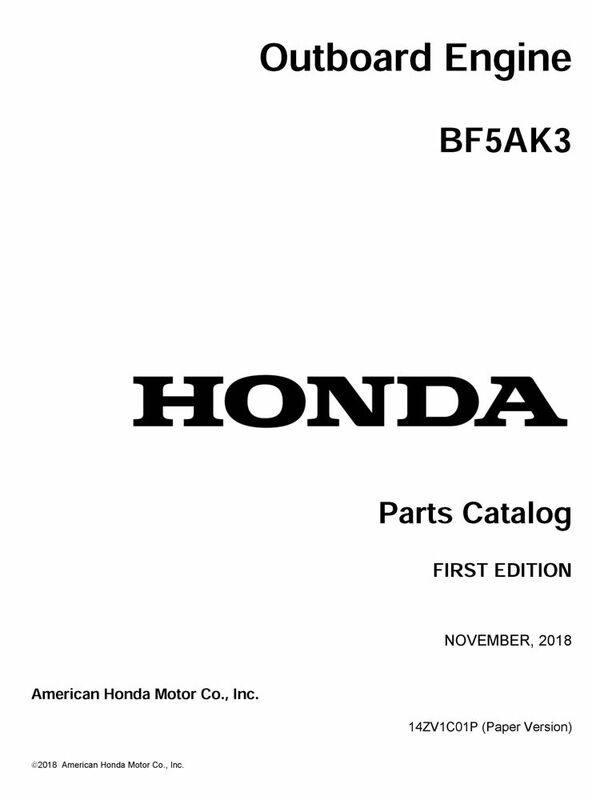 Paper parts catalog for the BF35AM, BF45AM, BF40A, BF40AW, BF40AX, BF50A, BF50AW, and BF50AX Marine Outboard Motors. See FAQs for assistance in locating your frame serial number. 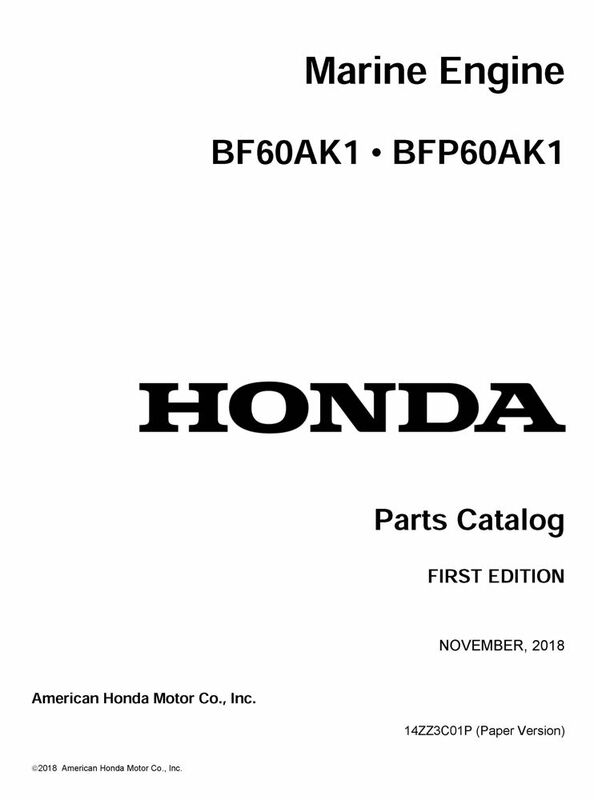 Paper parts catalog for the BF40A4, BF40A5, BF40A6, BF40AK0, BF50A4, BF50A5, BF50A6, and BF50AK0 Marine Outboard Motors. See FAQs for assistance in locating your frame serial number. 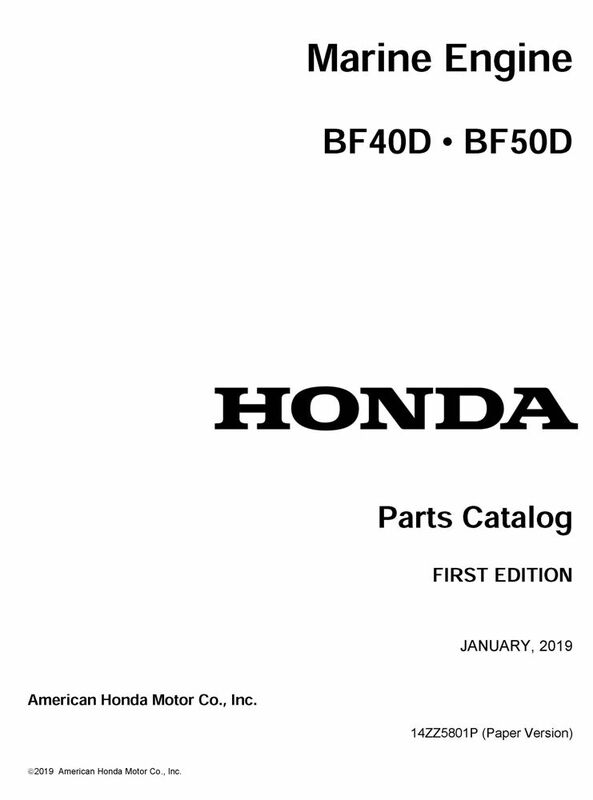 Paper parts catalog for the BF40AY, BF40A1, BF40A2, BF40A3, BF50AY, BF50A1, BF50A2, and BF50A3 Marine Outboard Motors. See FAQs for assistance in locating your frame serial number. 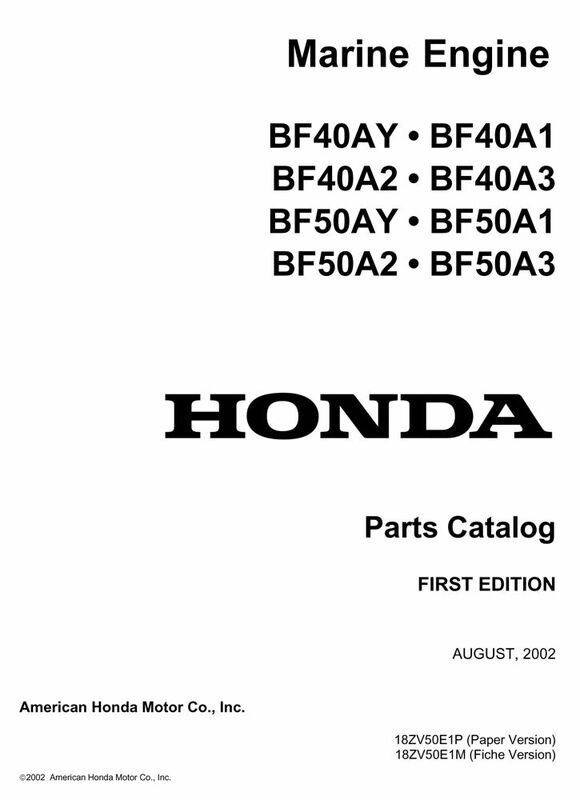 Paper parts catalog for the BF40D and BF50D Marine Outboard Motors. See FAQs for assistance in locating your frame serial number. 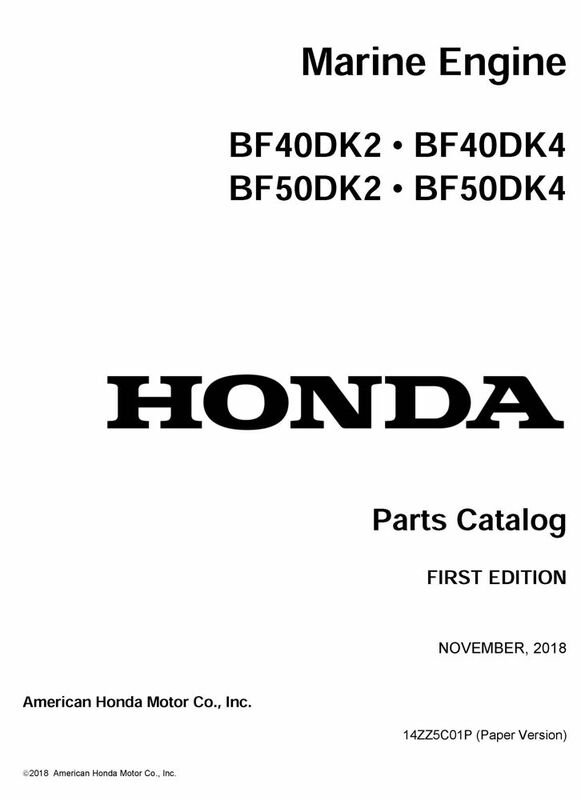 Paper parts catalog for the BF40DK2, BF40DK4, BF50DK2, and BF50DK4 Marine Outboard Motors. See FAQs for assistance in locating your frame serial number. 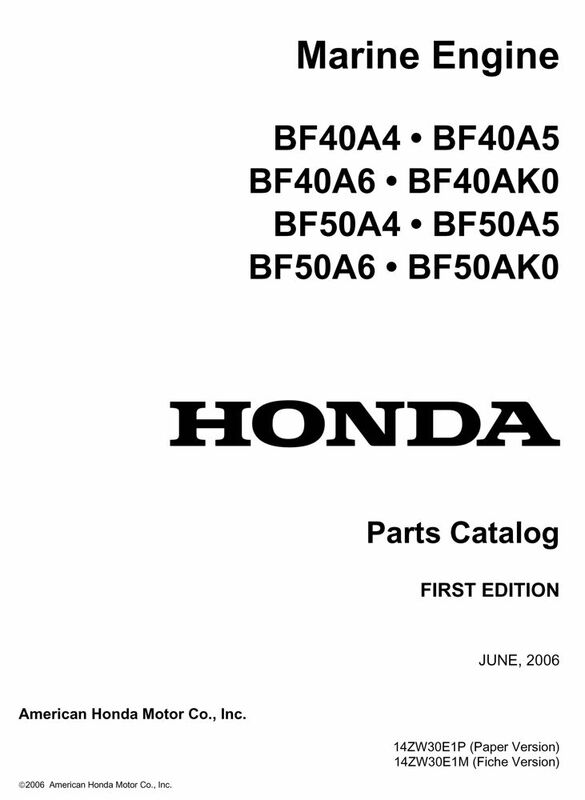 Paper parts catalog for the BF4AH, BF5DH, and BF6AH Marine Outboard Motors. See FAQs for assistance in locating your frame serial number. 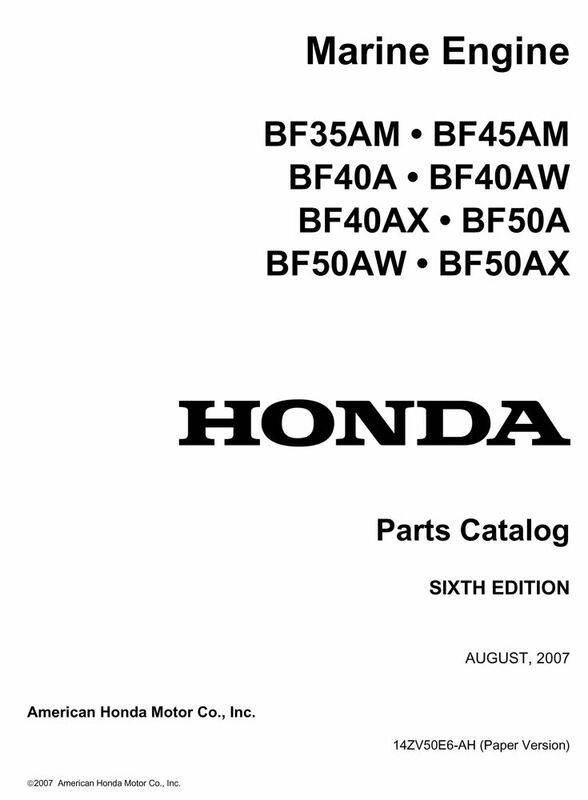 Paper parts catalog for the BF5A2, BF5A3, BF5A4, BF5A5, BF5A6, BF5AK0, and BF5AK2 Marine Outboard Motors. See FAQs for assistance in locating your frame serial number. 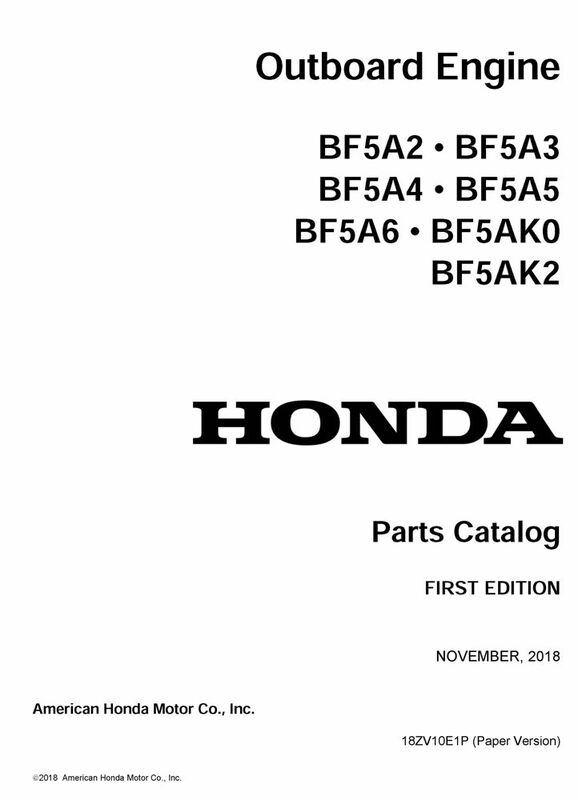 Paper parts catalog for the BF5AH, BF5AK, BF5AM, BF5AW, BF5AX, BF5AY, BF5A1, and BF50F Marine Outboard Motors. See FAQs for assistance in locating your frame serial number. 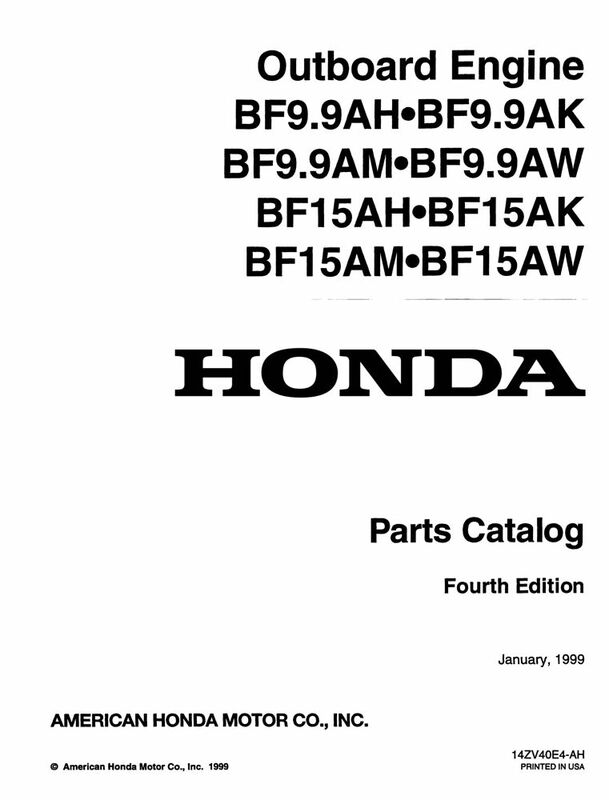 Paper parts catalog for the BF5AK3 Marine Outboard Motor. See FAQs for assistance in locating your frame serial number. 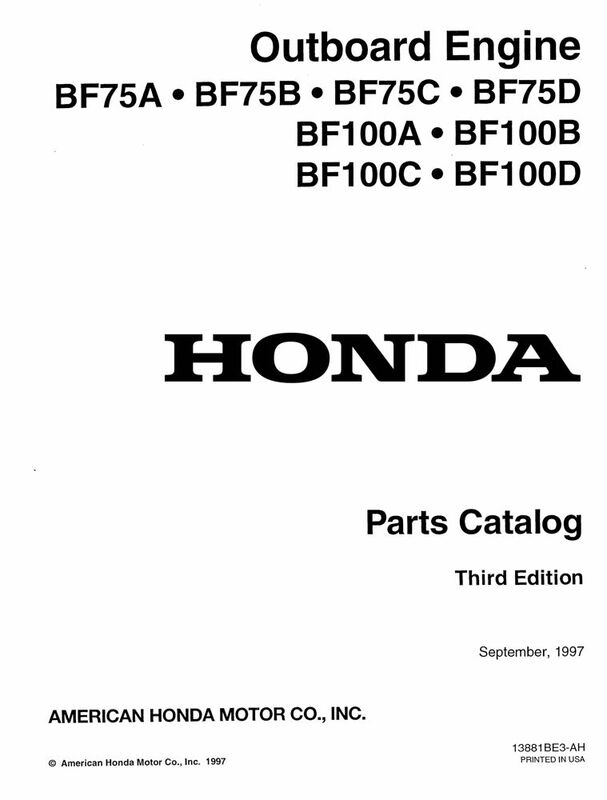 Paper parts catalog for the BF60A and BFP60A Marine Outboard Motors. See FAQs for assistance in locating your frame serial number. 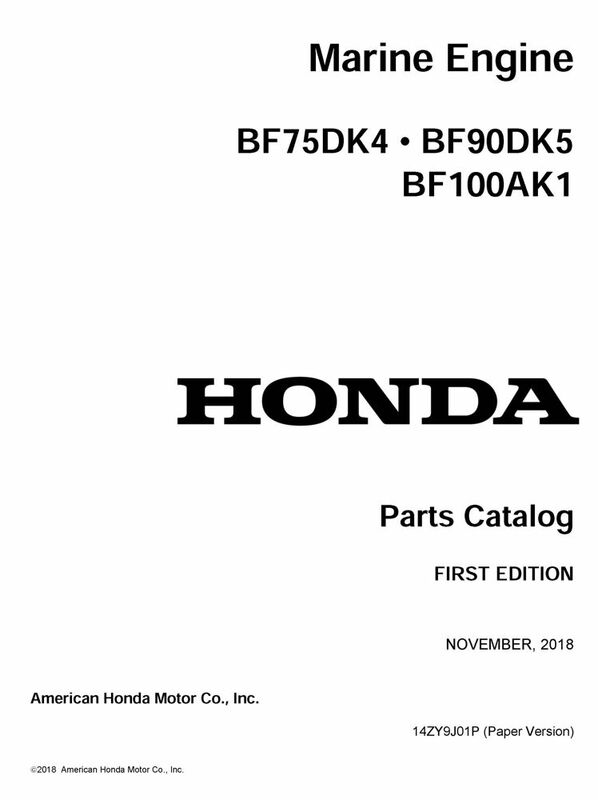 Paper parts catalog for the BF60AK1 and BFP60AK1 Marine Outboard Motors. See FAQs for assistance in locating your frame serial number. 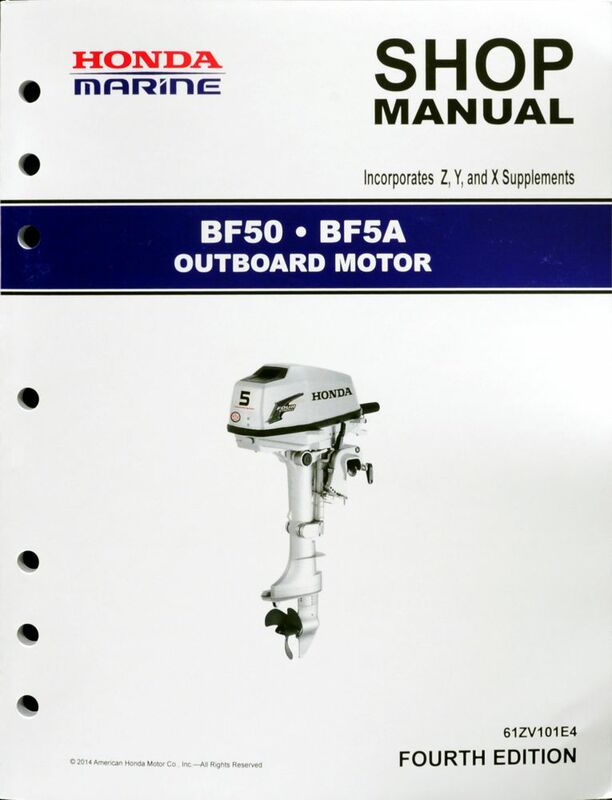 Paper parts catalog for the BF75, BF75Z, BF100, and BF100Z (7.5 hp, 10.0 hp) Marine Outboard Motors. See FAQs for assistance in locating your frame serial number. Enter your serial number prefix (such as BF75) in the search box to locate applicable shop manuals, parts catalogs, and free downloads. Paper parts catalog for the BF75A, BF75B, BF75C, BF75D, BF100A, BF100B, BF100C, and BF100D (7.5 and 10 hp) Marine Outboard Motors. See FAQs for assistance in locating your frame serial number. Paper parts catalog for the BF75A1, BF75A2, BF75A3, BF75A4, BF90A1, BF90A2, BF90A3, and BF90A4 Marine Outboard Motors. See FAQs for assistance in locating your frame serial number. 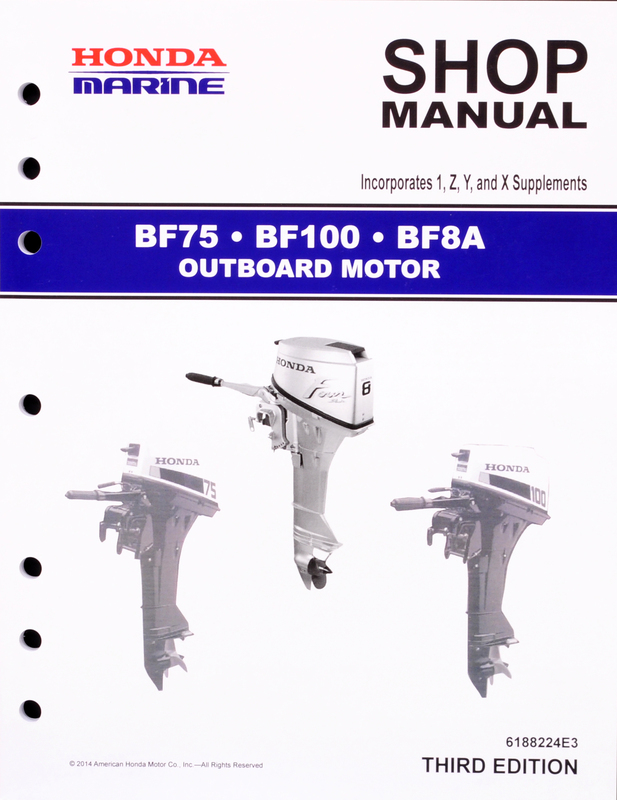 Paper parts catalog for the BF75A5, BF75A6, BF90A5, and BF90A6 Marine Outboard Motors. See FAQs for assistance in locating your frame serial number. 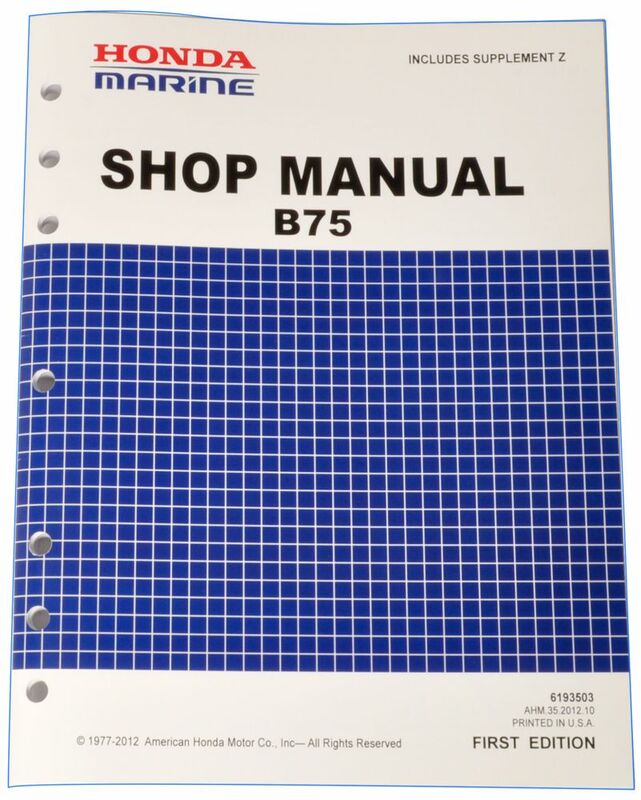 Paper parts catalog for the BF75AT, BF75AW, BF75AX, BF75AY, BF90AT, BF90AW, BF90AX, and BF90AY Marine Outboard Motors. See FAQs for assistance in locating your frame serial number. 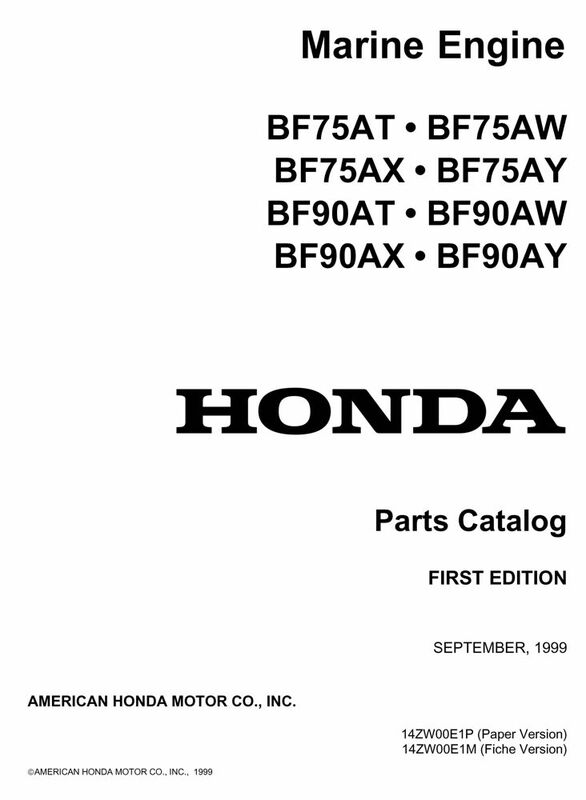 Paper parts catalog for the BF75DK0 and BF90DK0 Marine Outboard Motors. See FAQs for assistance in locating your frame serial number. 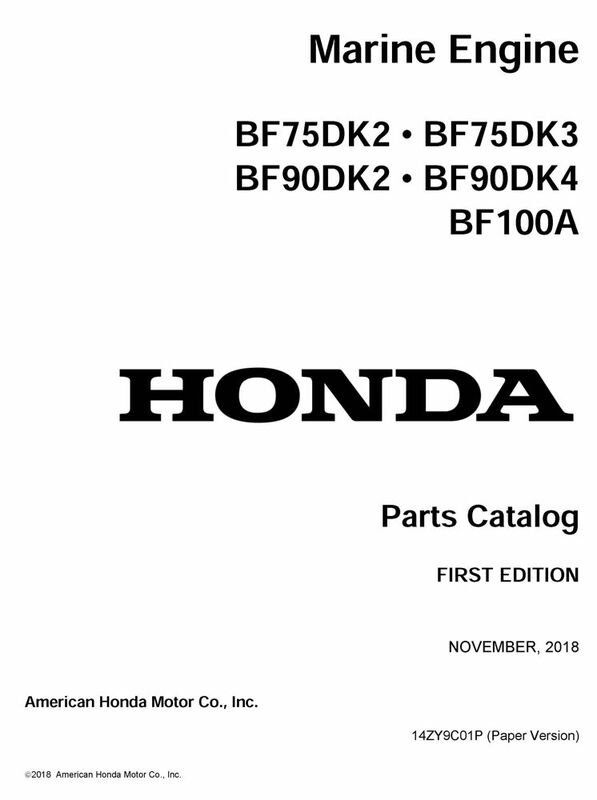 Paper parts catalog for the BF75DK2, BF75DK3, BF90DK2, BF90DK4, and BF100A Marine Outboard Motors. See FAQs for assistance in locating your frame serial number. 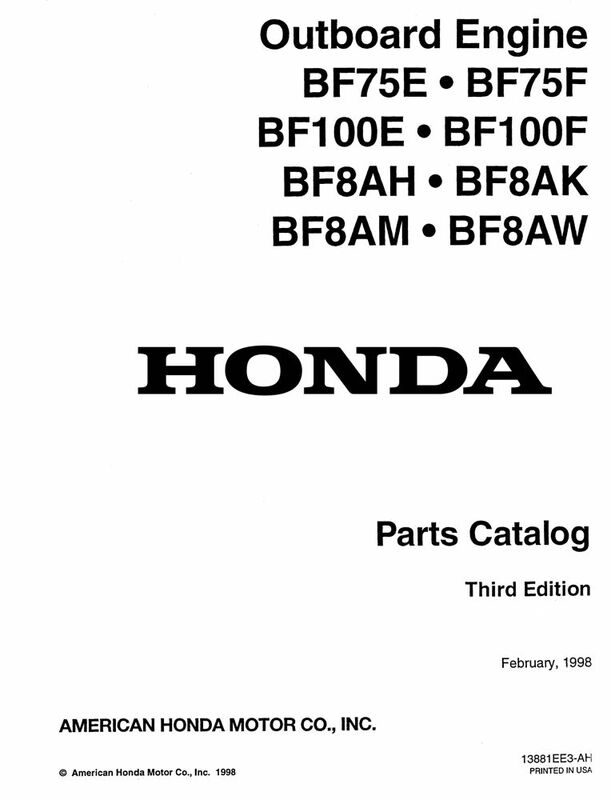 Paper parts catalog for the BF75DK4, BF90DK5, and BF100AK1 Marine Outboard Motors. See FAQs for assistance in locating your frame serial number. 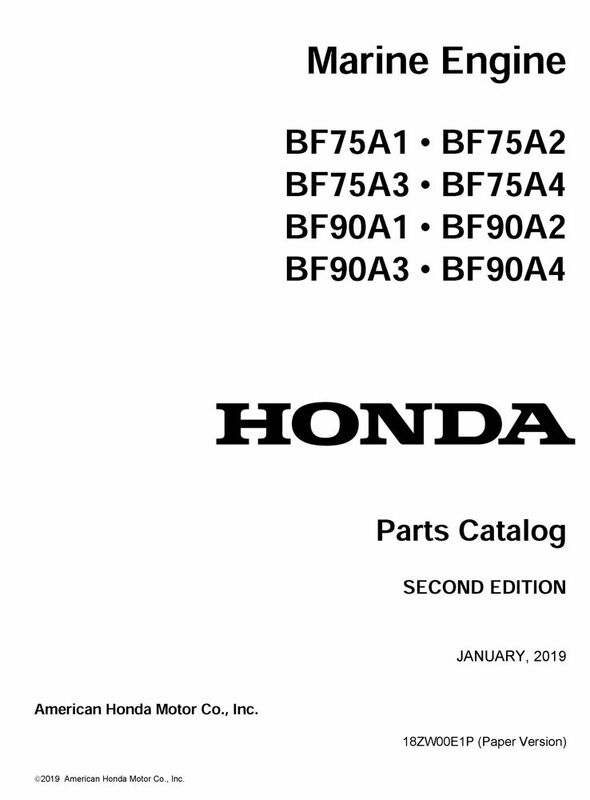 Paper parts catalog for the BF75E, BF75F, BF100E, BF100F, BF8AH, BF8AK, BF8AM, and BF8AW (7.5 hp, 8.0 hp, 10.0 hp) Marine Outboard Motors. See FAQs for assistance in locating your frame serial number. 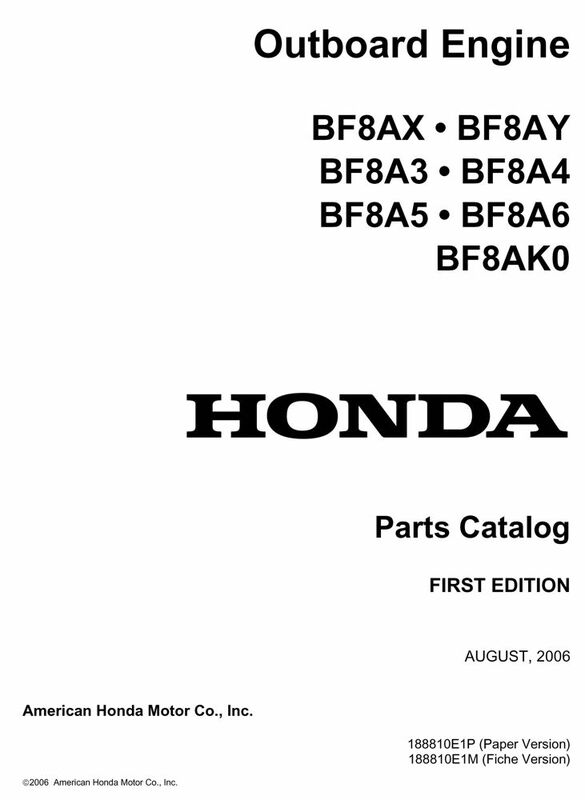 Paper parts catalog for the BF8AX, BF8AY, BF8A3, BF8A4, BF8A5, BF8A6, and BF8AK0 Marine Outboard Motors. See FAQs for assistance in locating your frame serial number. Paper parts catalog for the BF8D1, BFP8D1, BF8D2, BFP8D2, BF9.9D1, BFP9.9D1, BF9.9D2, and BFP9.9D2 Marine Outboard Motors. See FAQs for assistance in locating your frame serial number. Paper parts catalog for the BF8D3, BFP8D3, BF8D4, BFP8D4, BF9.9D3, BFP9.9D3, BF9.9D4, and BFP9.9D4 Marine Outboard Motors. See FAQs for assistance in locating your frame serial number. Paper parts catalog for the BF8D5, BFP8D5, BF8D6, BFP8D6, BF9.9D5, BFP9.9D5, BF9.9D6, and BFP9.9D6 Marine Outboard Motors. See FAQs for assistance in locating your frame serial number. 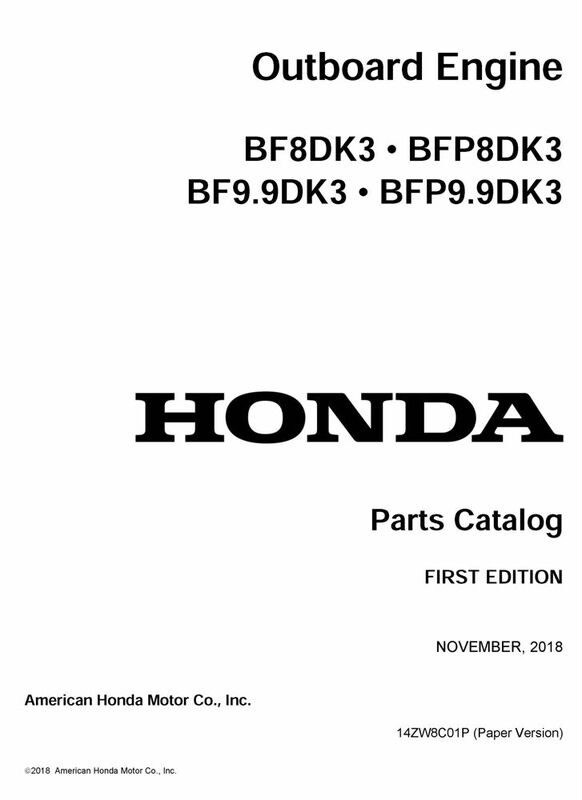 Paper parts catalog for the BF8DK0, BFP8DK0, BF8DK2, BFP8DK2, BF9.9DK0, BFP9.9DK0, and BF9.9DK2 BFP9.9DK2 Marine Outboard Motors. See FAQs for assistance in locating your frame serial number. 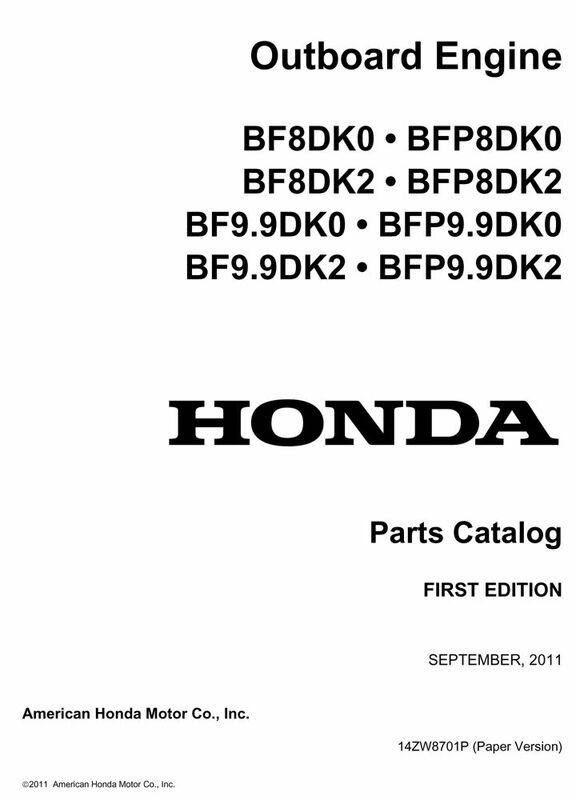 Paper parts catalog for the BF8DK3, BFP8DK3, BF9.9DK3, and BFP9.9DK3 Marine Outboard Motors. See FAQs for assistance in locating your frame serial number. 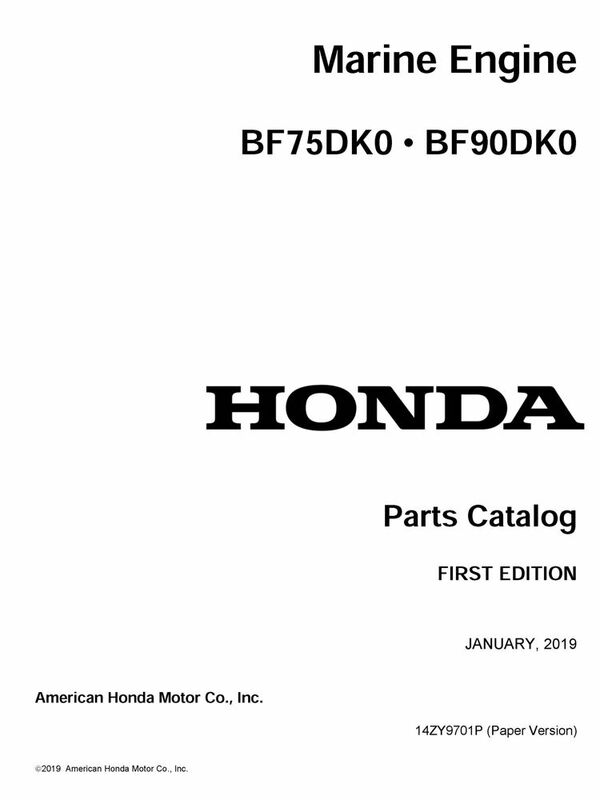 Paper parts catalog for the BF9.9AH, BF9.9AK, BF9.9AM, BF9.9AW, BF15AH, BF15AK, BF15AM, and BF15AW Marine Outboard Motors. See FAQs for assistance in locating your frame serial number. Paper parts catalog for the BF9.9AX, BF9.9AY, BF15AX, BF15AY, BF15A1, BF15A2, and BF15A3 Marine Outboard Motors. See FAQs for assistance in locating your frame serial number. This consumer handout provides step-by-step instructions for gear case oil change. Step-by-step instructions for cleaning and flushing BF25A/D and BF30A/D marine engines. Step-by-step instructions for cleaning and flushing BF35A, BF40A/D, BF45A, and BF50A/D marine engines. Step-by-step instructions for gear case oil change on BF2 through BF30 outboard motors. Step-by-step instructions for gear case oil change on BF35 through BF250 marine engines. 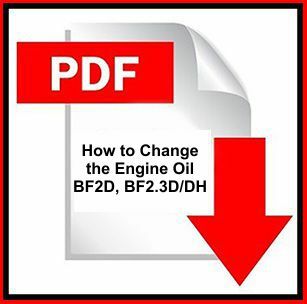 This consumer handout discusses how to change the engine oil in your BF2D or BF2.3D/DH outboard motor. This consumer handout discusses how to reset the hour counter after performing periodic maintenance. 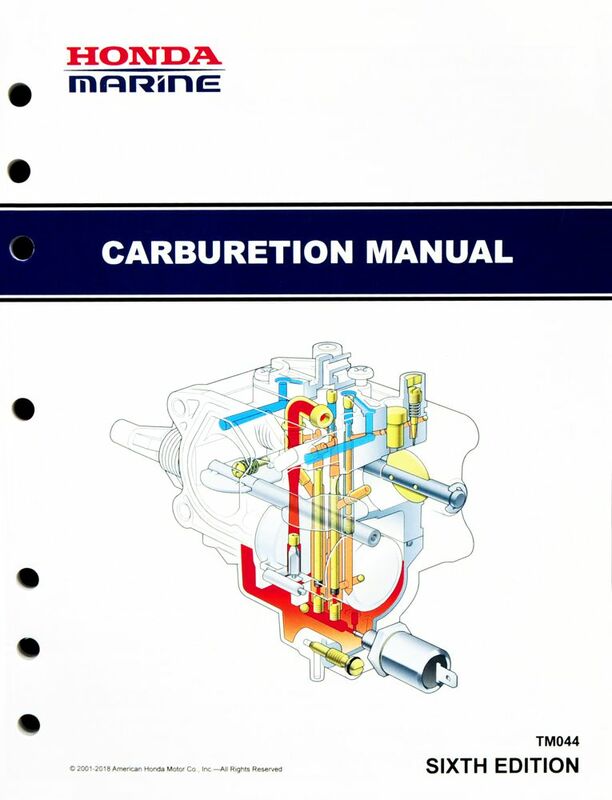 The Honda Marine Carburetion Manual is a full-color manual covering function, tools, fuel delivery, troubleshooting/disassembly/cleaning, assembly/adjustment, storage, testing dynamic/static, high elevation operation, and emission regulations for all Honda Marine carbureted outboards. 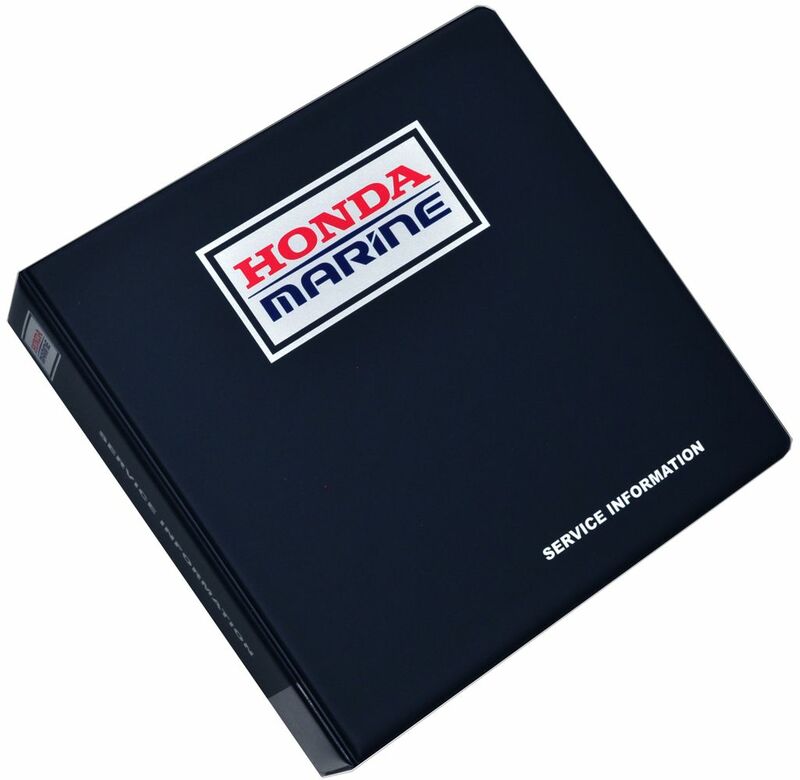 The Honda Marine 2 1/2" 7-Ring Binder is dark blue in color, with the Honda Marine logo on the front and spine. Heavy-duty snap and lock. This fully illustrated color poster covers BF115A, BF130A PGM-FI self-diagnosis function, warning lamp indication, trouble codes, and ECU reset method. This fully illustrated color poster applies to BF40A and BF50A power trim & tilt/remote control type marine engines. This fully illustrated color poster applies to BF75A and BF90A power trim & tilt/remote control type marine engines. This fully illustrated color poster applies to BF25A and BF30A remote control type marine engines. This fully illustrated color poster applies to BF40D and BF50D remote control type marine engines. This fully illustrated color poster applies to BF75D and BF90D marine engines with remote control. Fully illustrated color wiring diagram in PDF format for Remote Control Type (when using the side mount remote control box). This fully illustrated color poster applies to BF75DK3 and BF90DK4 marine engines remote control type (when using the side mount remote control box). Your Honda Marine engine is designed and manufactured to precise specifications to ensure years of trouble-free operation. This consumer handout provides steps to avoid salt/polluted water problems. Your Honda Marine engine is designed and manufactured to precise specifications to ensure years of troublefree operation. Operating and storing of your engine in salt water or polluted water may have adverse effects on your outboard. The good news is most salt/polluted water problems can be avoided by following a few simple steps. Fully illustrated color wiring diagram in PDF format for Tiller Handle Type. This fully illustrated color poster applies to BF75DK3 and BF90DK4 marine engines tiller handle type. This consumer handout provides step-by-step instructions for replacing the water pump. Step-by-step instructions for replacing the water pump on BF115D, BF135A, and BF150A marine engines. Step-by-step instructions for replacing the water pump on BF200A, BF225A marine engines. Step-by-step instructions for replacing the water pump on BF25A/D and BF30A/D marine engines. Step-by-step instructions for replacing the water pump on BF40D and BF50D marine engines. Step-by-step instructions for replacing the water pump on BF5A outboard motors. Step-by-step instructions for replacing the water pump on BF60A and BFP60A marine engines. Step-by-step instructions for replacing the water pump on BF75D and BF90D marine engines. Step-by-step instructions for replacing the water pump on BF8D and BF9.9D outboard motors. This fully illustrated color poster applies to BF135A and BF150A marine engines. This fully illustrated color poster applies to BF200AK3 and BF225AK3 marine engines. Frame serial ranges BAEJ/BAFJ/BAGJ/BAHJ-1800001 through 9999999.